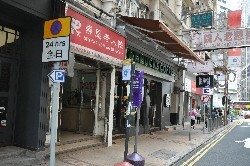 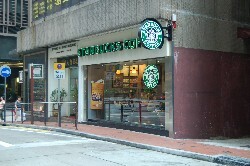 One of the smallest stores in Hong Kong! 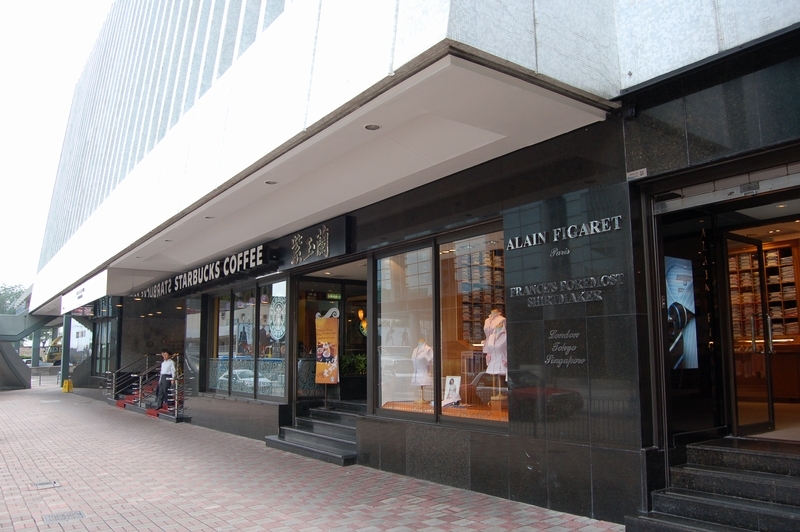 This store, relocated from Hysan Avenue, is very small, but makes up for its size with style. 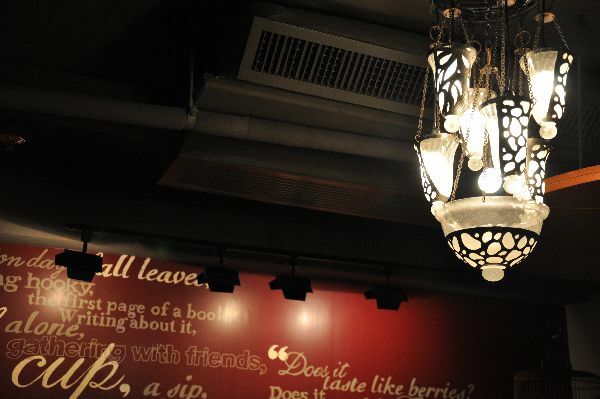 The design is the new 2010 style featuring reclaimed furnishings, and its coolest touch is what a decoration made to look like the lid from an Indian tea create, mounted on a wall next to the bathrooms. 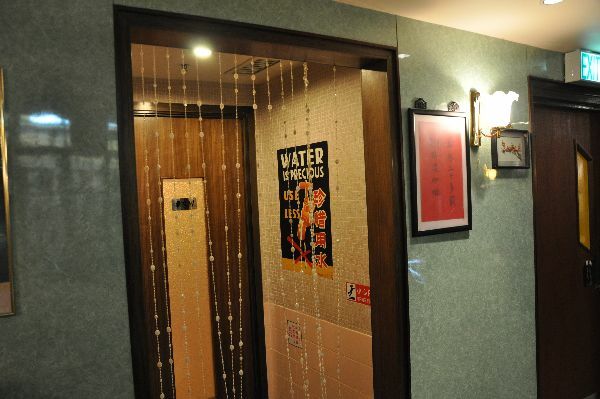 And rather than "M" and "W" to designate the two toilets, they have instead stylistic male/female metal emblems. 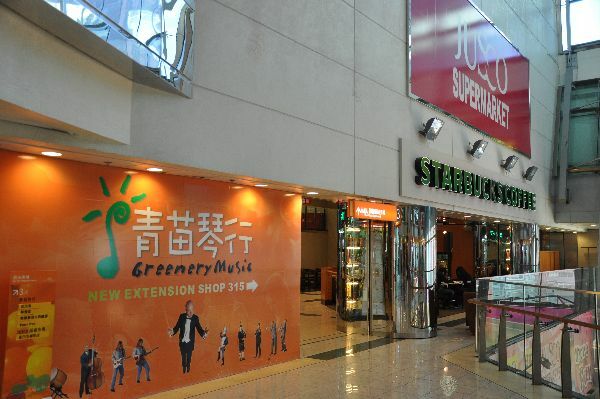 This newer store not only features the new style of design element, using reclaimed materials, but also has a bit of quirky nature. 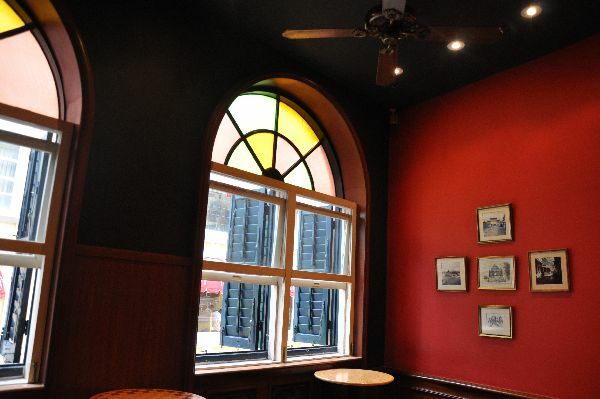 You will immediately notice the old window panes mounted on the columns, but if you look more closely you will see a cute little sign that reads "i'm a HOSE REEL". 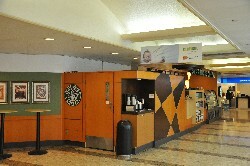 Towards the back is a large Starbucks cup with the new logo, and on a wall are shelves holding books, photos, and a truly quirky touch, an old General Electric clock radio. 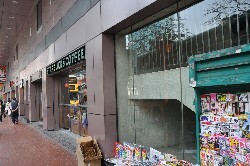 Of all the stores in the Central district, this one seems the most "Asian" to me. 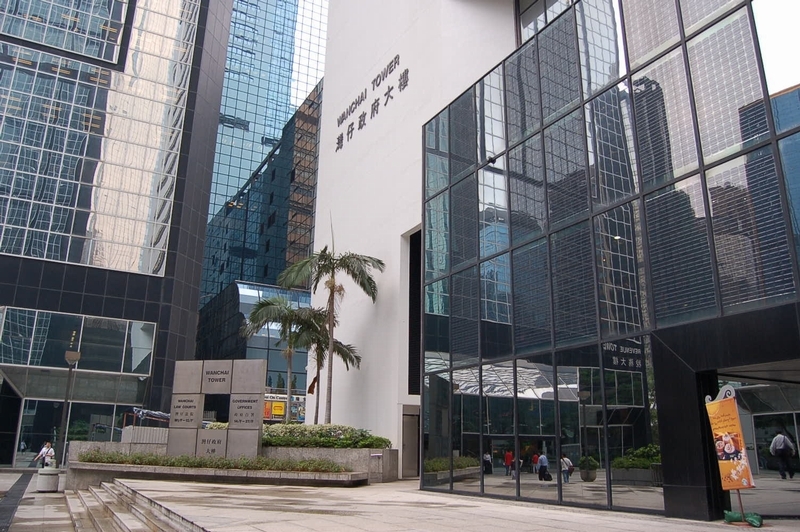 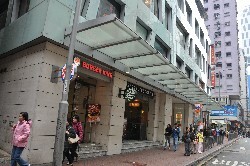 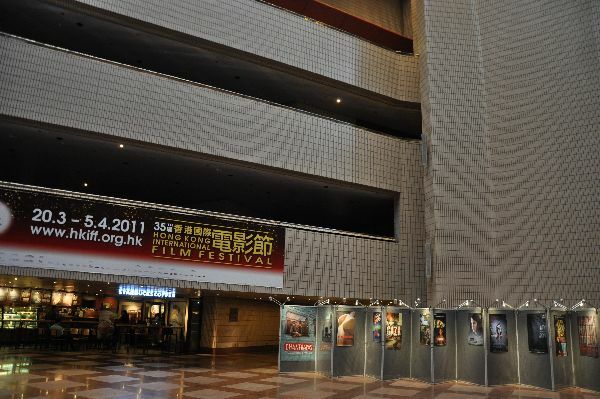 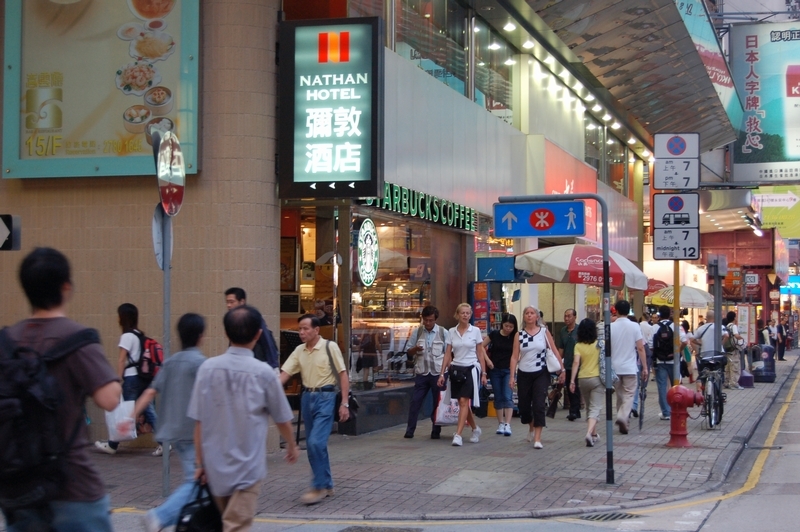 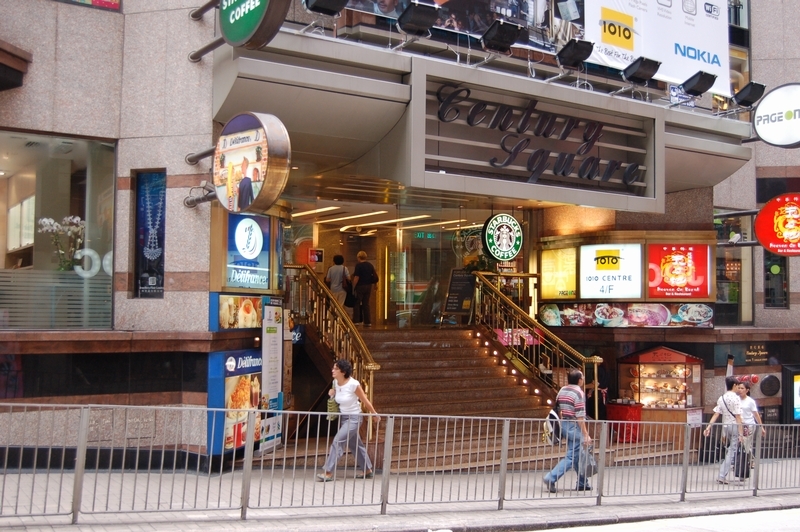 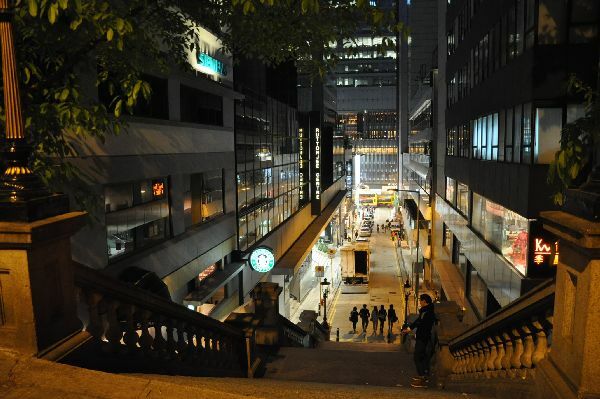 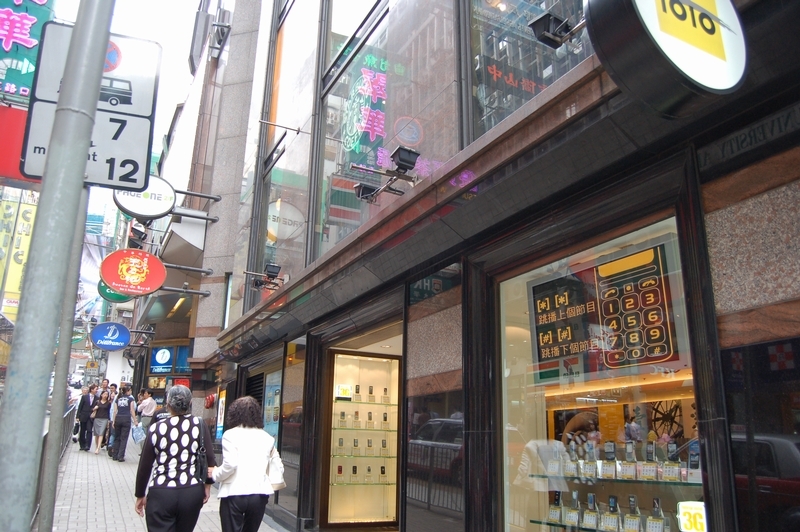 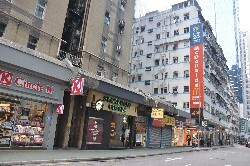 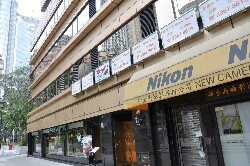 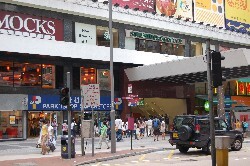 This was Hong Kong's flagship store in 2006, although I'm not sure it retains that status now that Duddell Street is open. 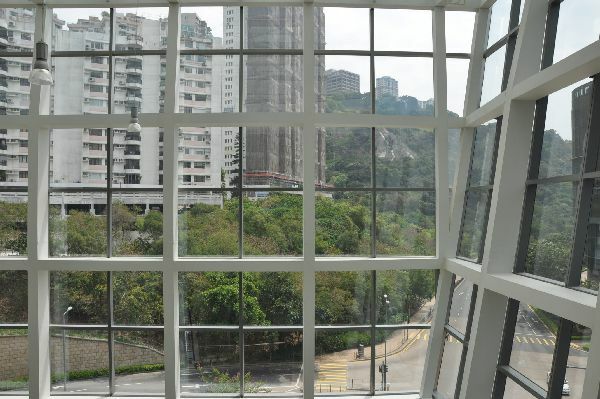 Click 'more' to see the view from across the balcony. 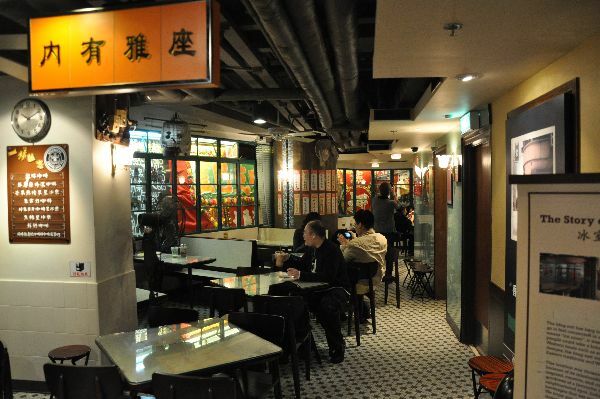 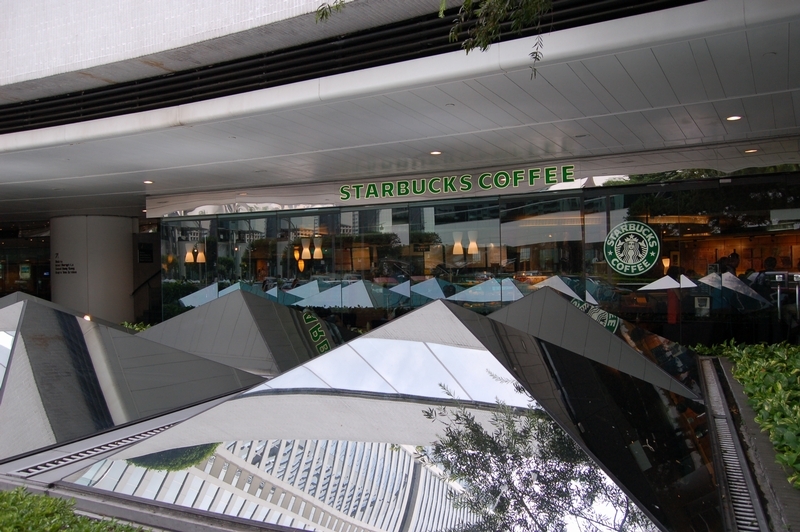 This singularly unique Starbucks is the coolest in Hong Kong, and one of the coolest I have seen in the entire world--perhaps only Capucines in Paris is better. 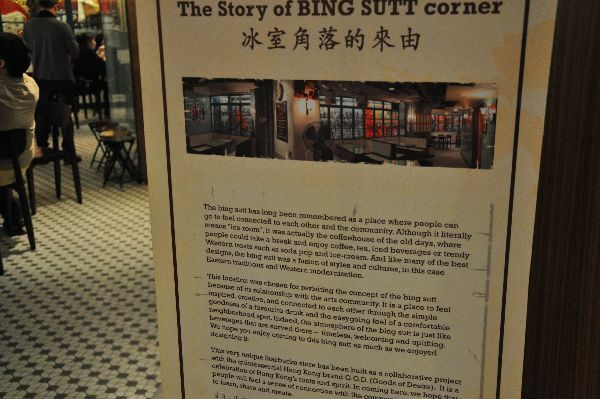 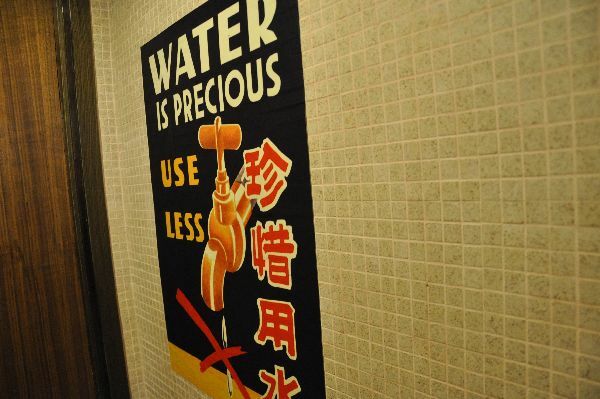 The store follows the "bing sutt" (ice house) concept of old, as explained by two signs. 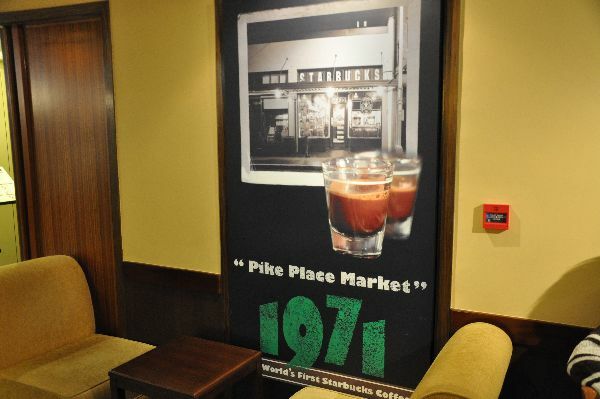 The store displays old photos of both the building and adjacent Ice House Street as well as tributes to the Pike Place store. 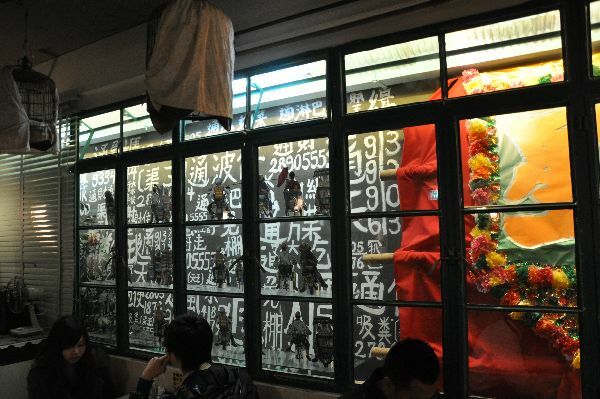 I cannot even begin to list all of the cool decorations and memoriabilia in the store--you'll just have to save up and visit Hong Kong when you can! 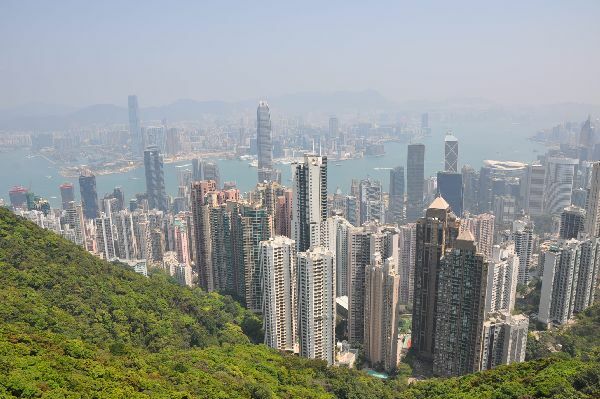 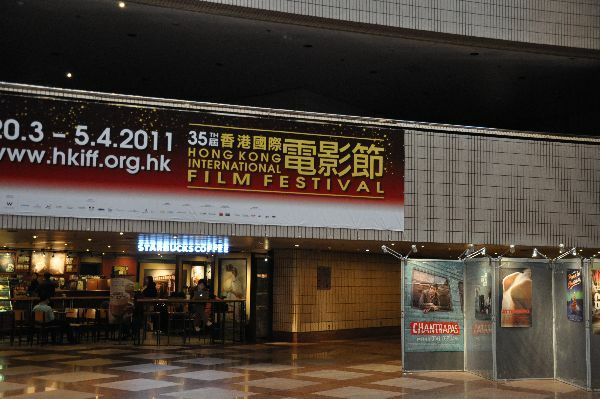 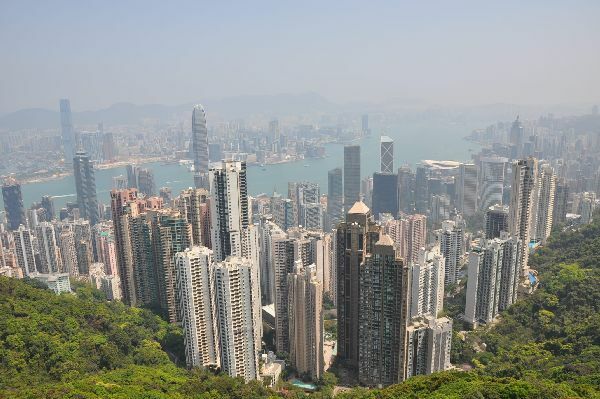 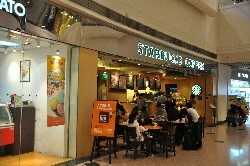 The first in Hong Kong! 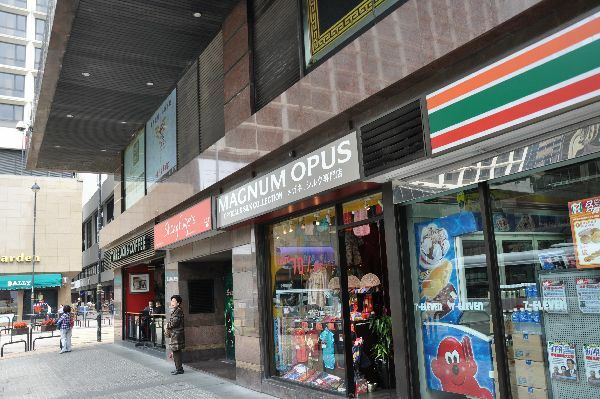 This store is up on the second floor, fairly unusual. 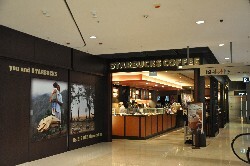 This newer store sports a new design concept that uses a lot of reclaimed materials. 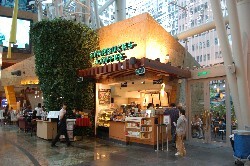 Besides that, there is an entire wall dedicated to showing photos of environmental stewardship. 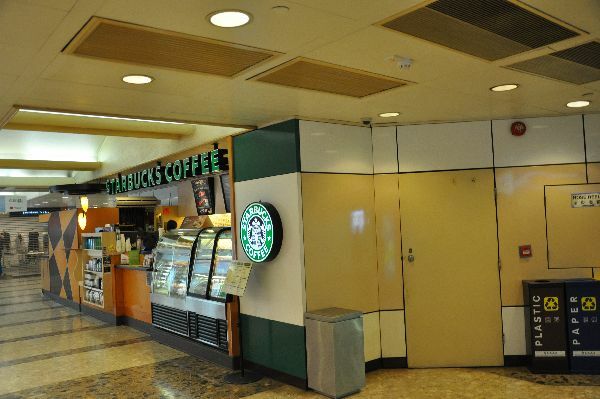 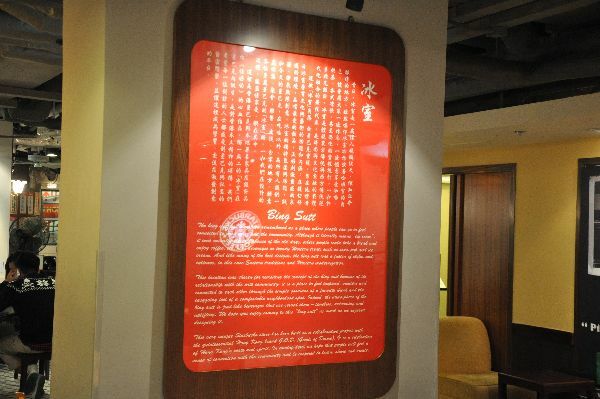 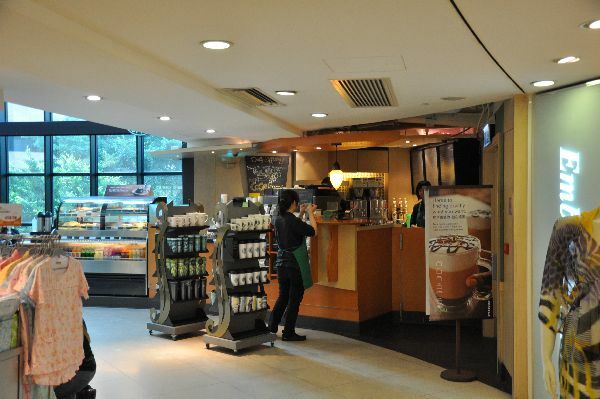 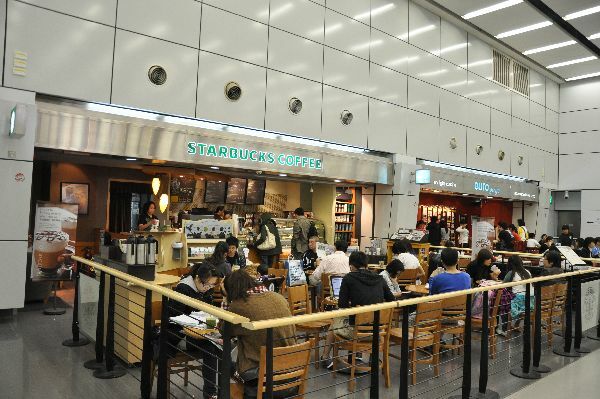 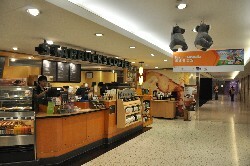 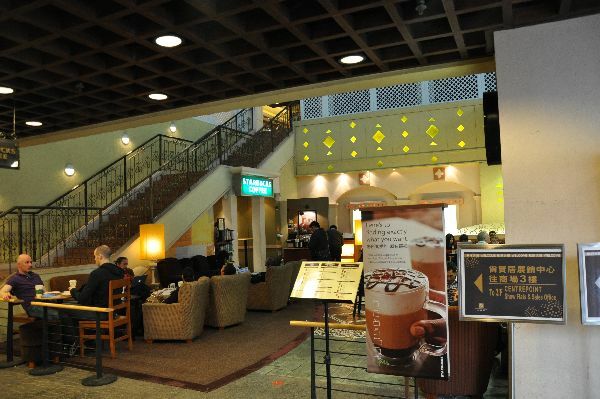 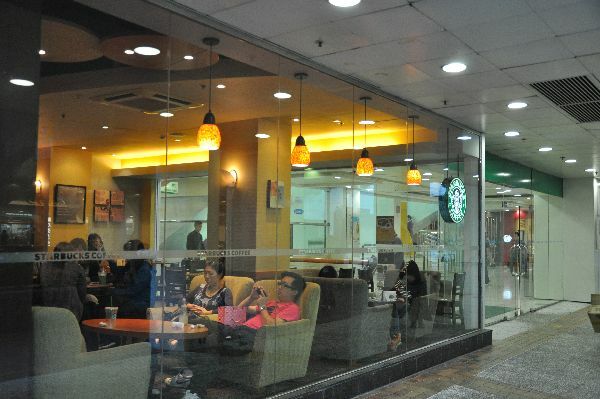 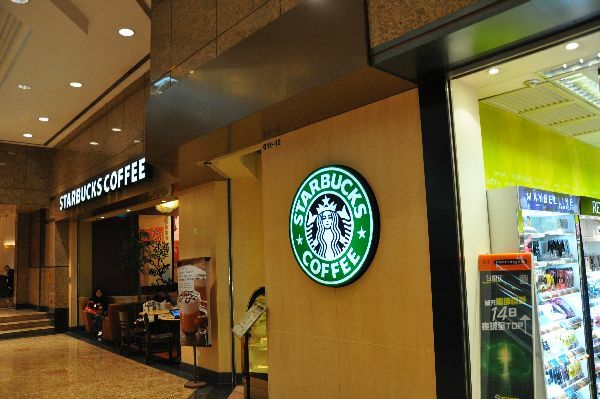 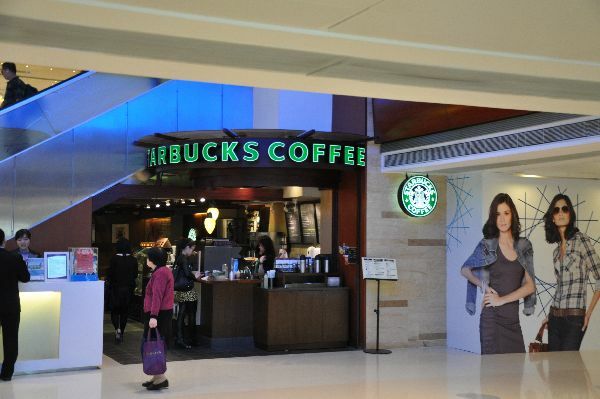 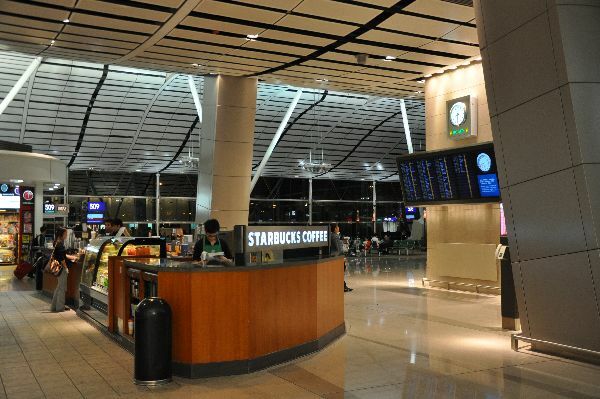 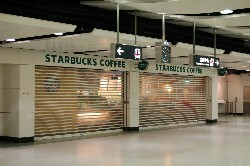 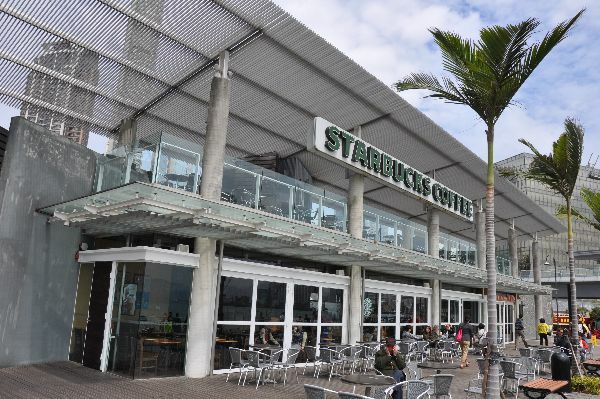 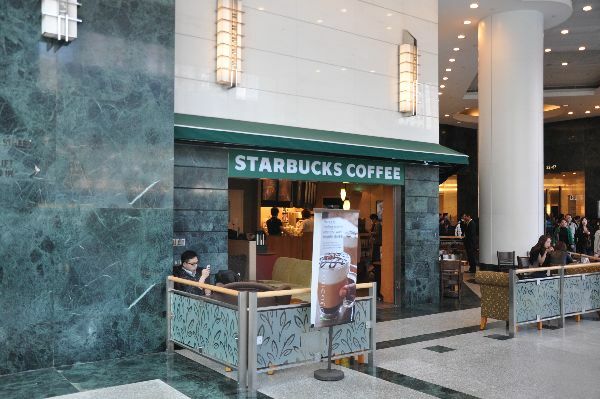 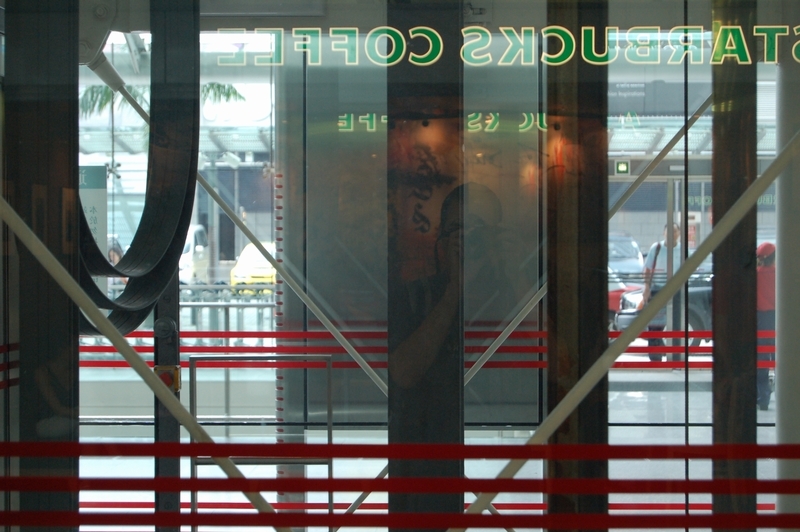 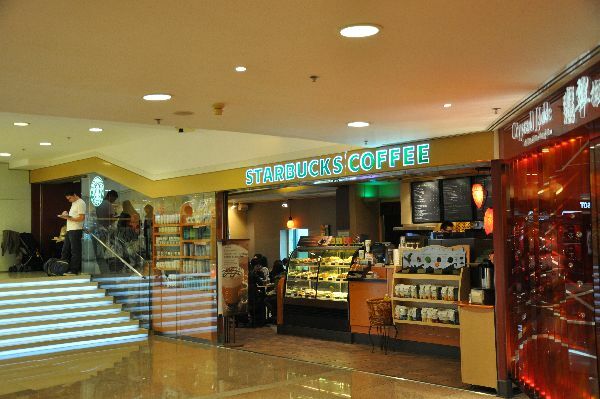 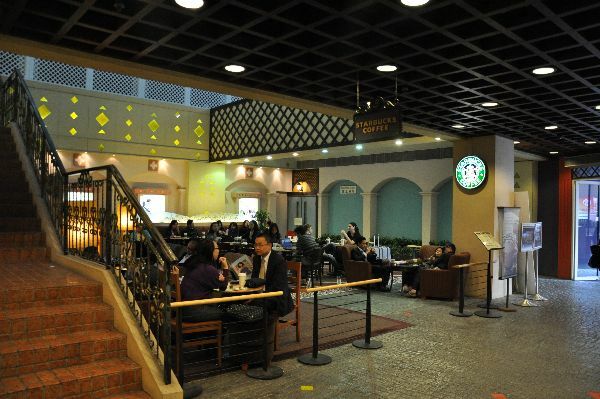 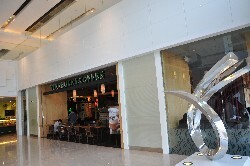 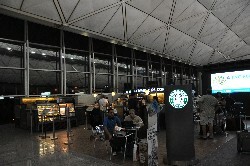 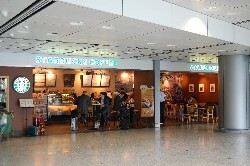 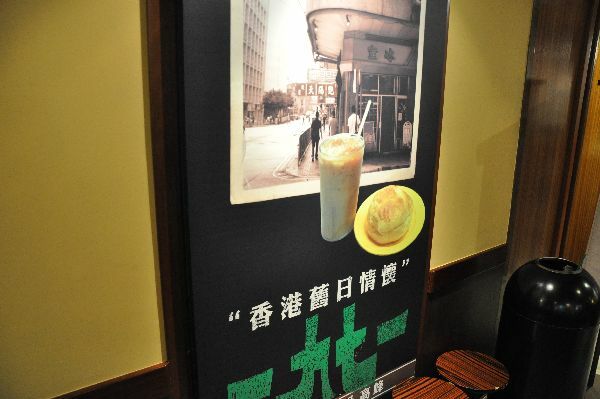 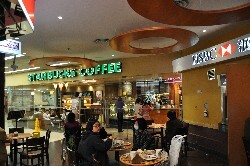 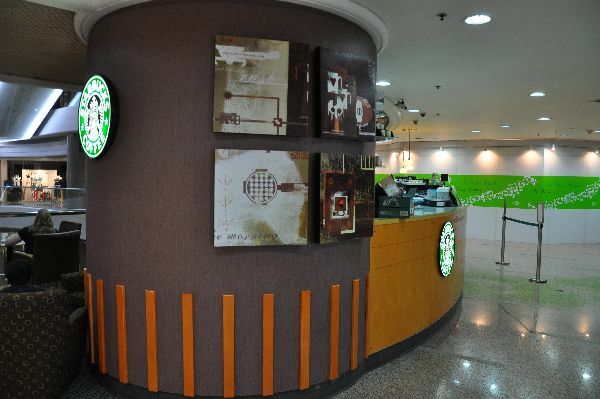 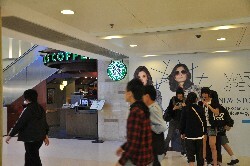 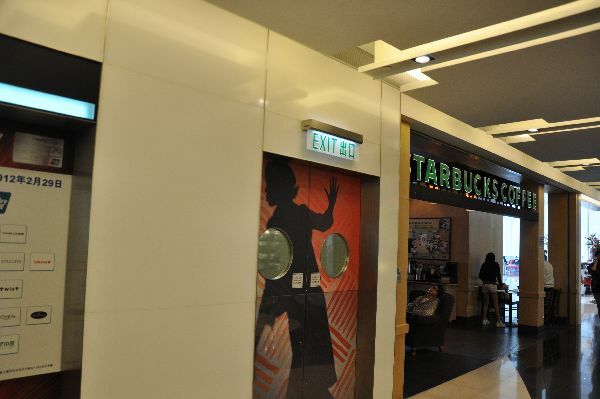 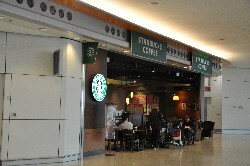 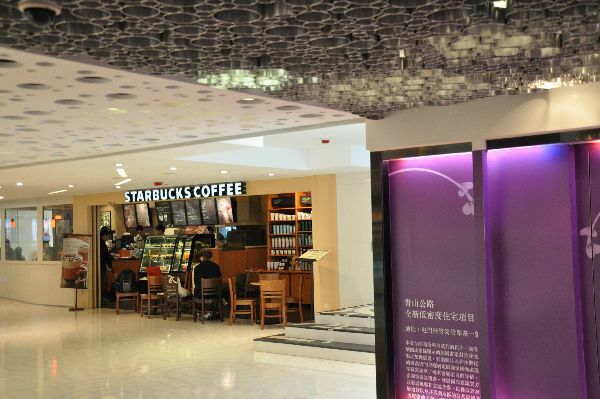 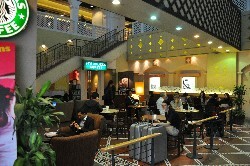 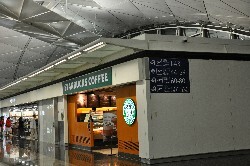 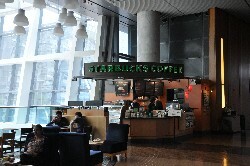 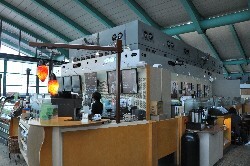 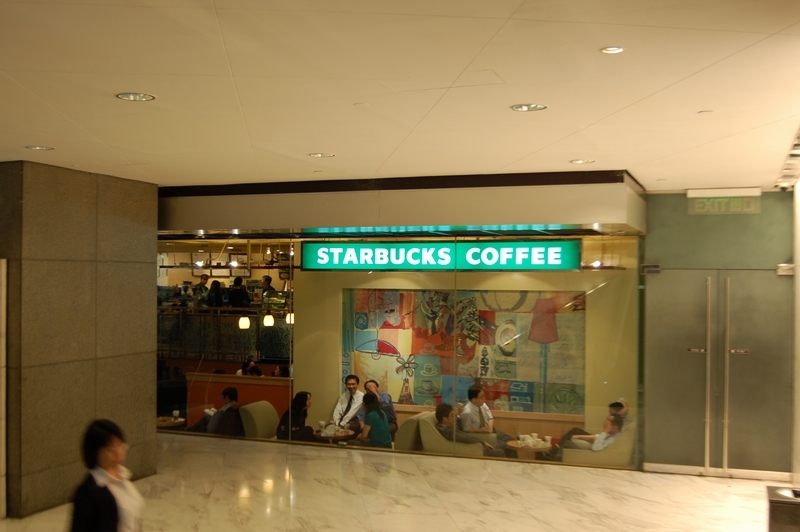 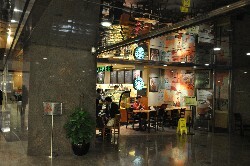 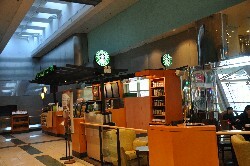 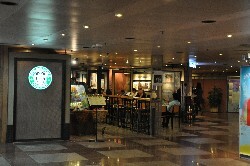 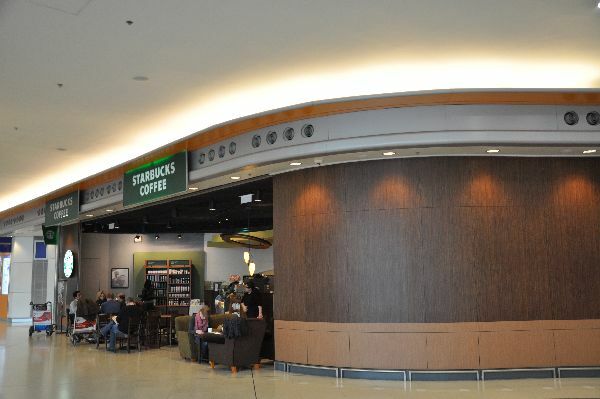 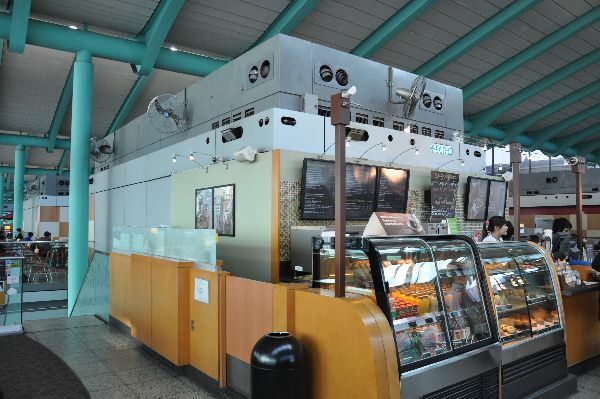 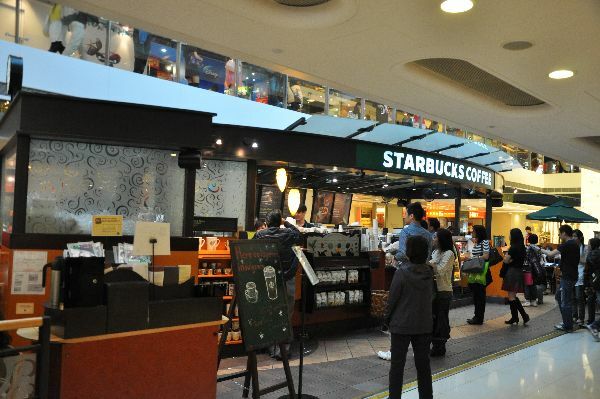 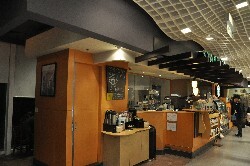 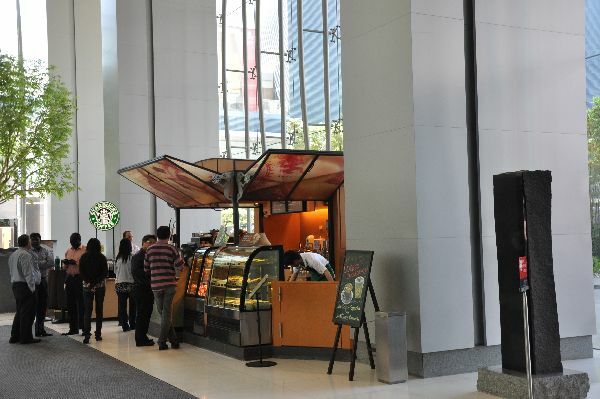 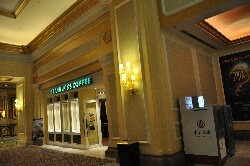 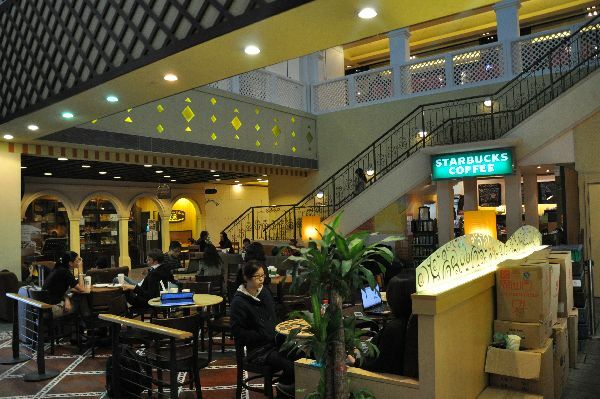 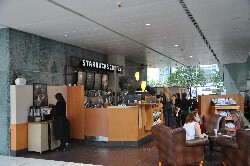 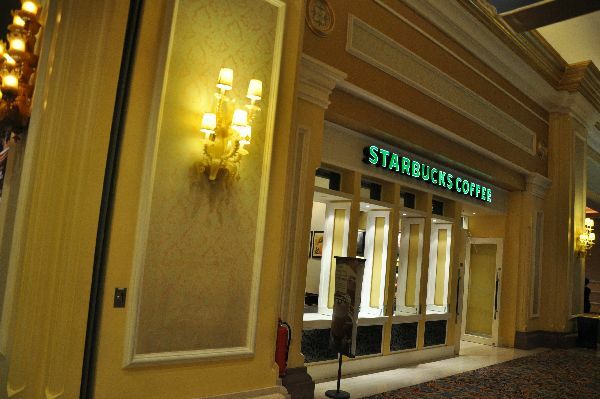 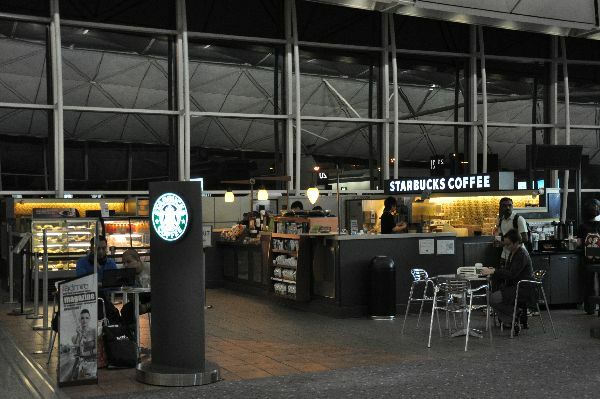 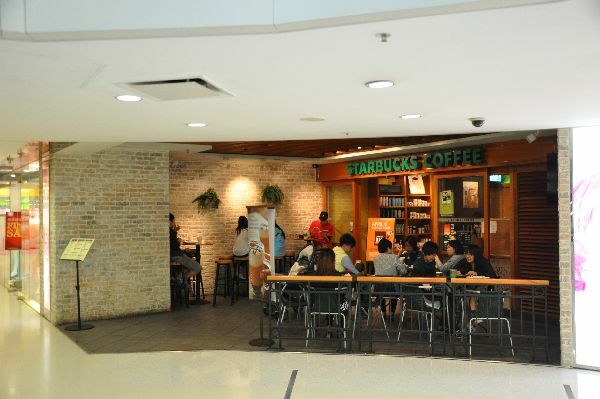 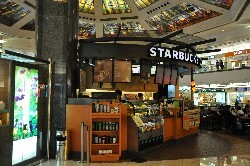 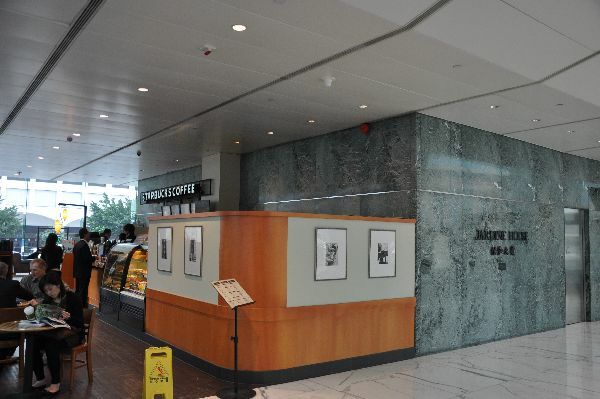 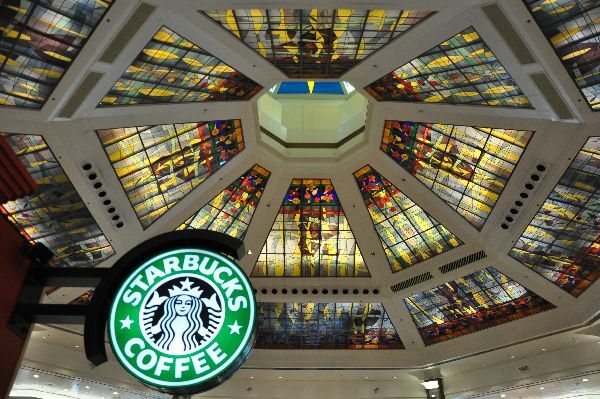 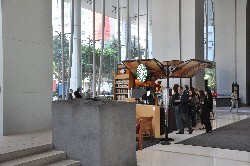 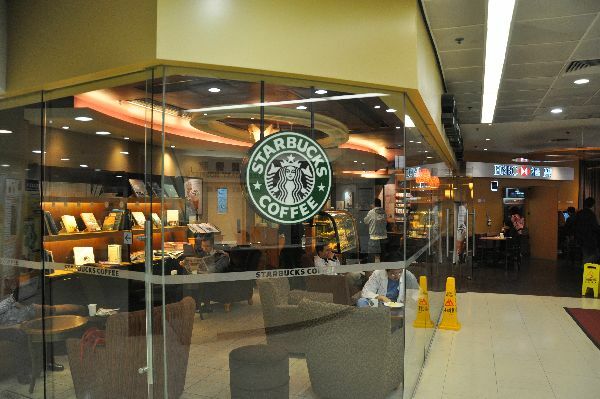 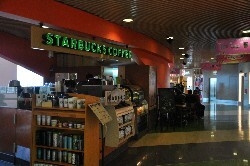 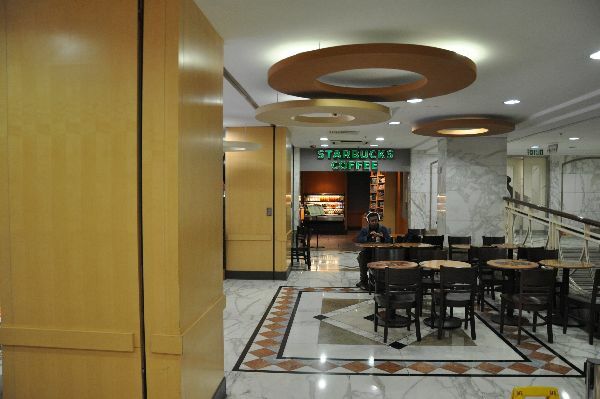 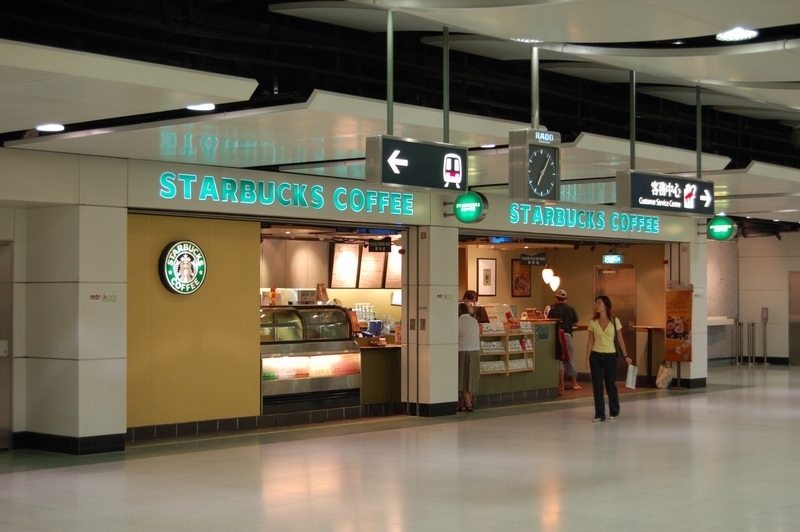 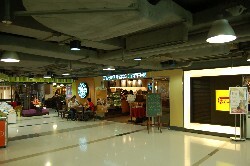 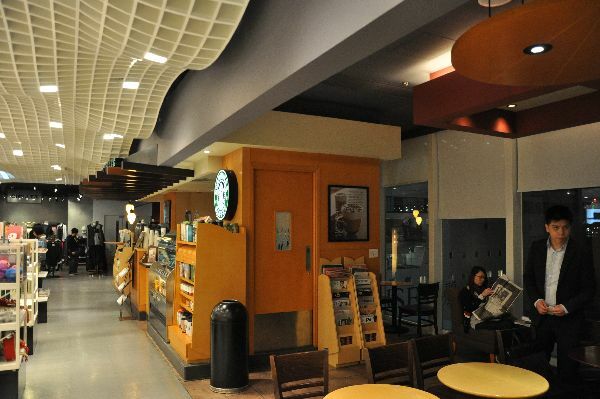 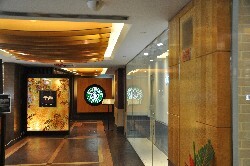 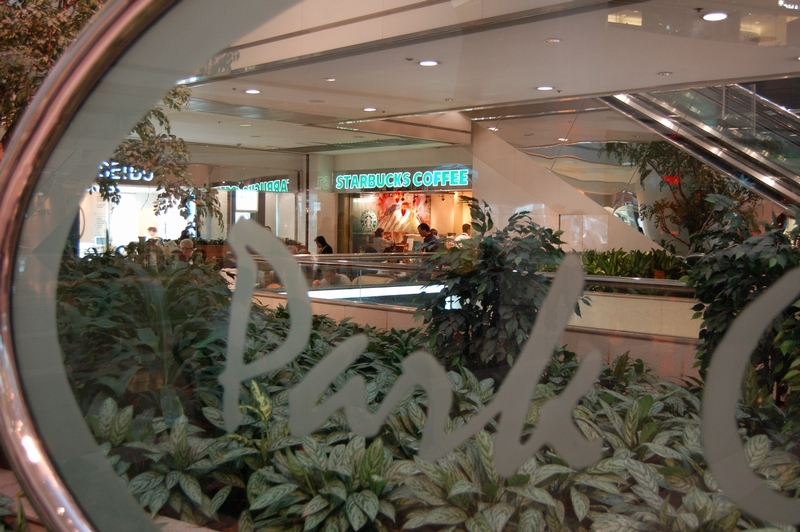 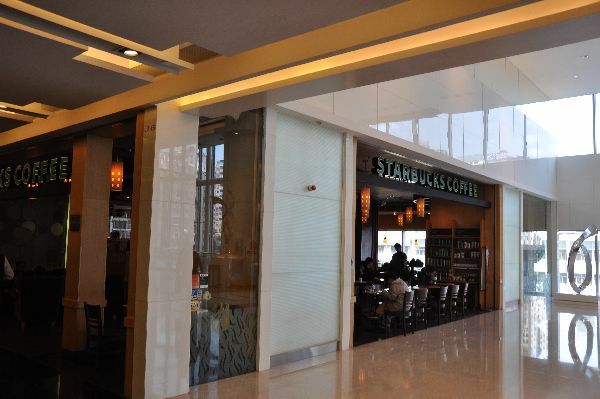 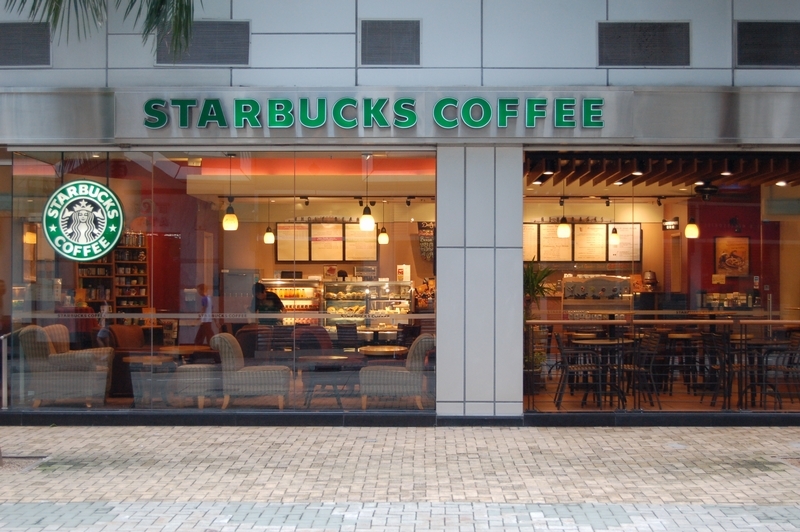 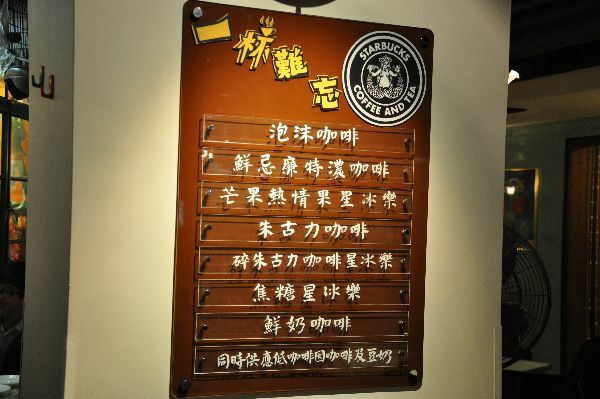 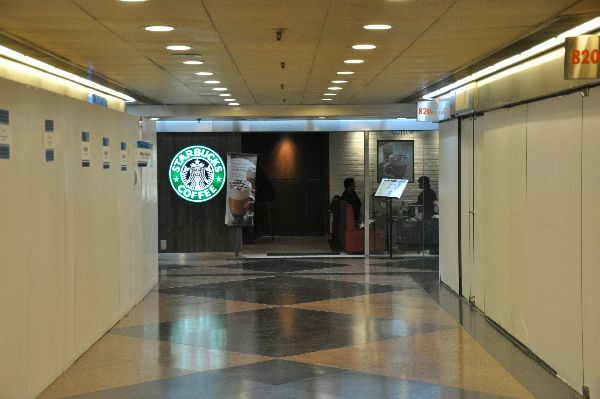 In the back, look for three displays depicting the history of the Starbucks name and logo. 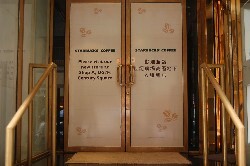 This store is dedicated to Simona Chang. 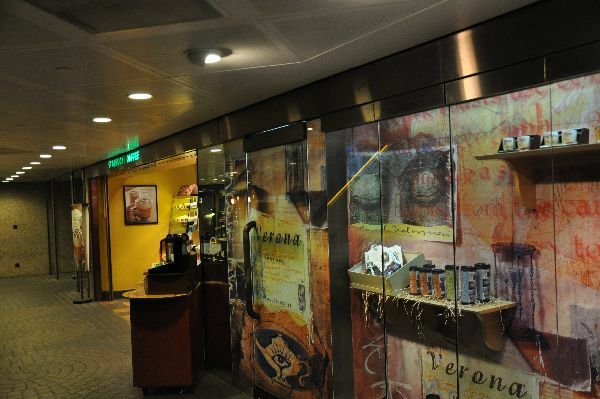 This store has a cool new concept, a lot of food offerings--meals, not just snacks--like lasagna or beef chili, prominently displayed in a large glass case up front. 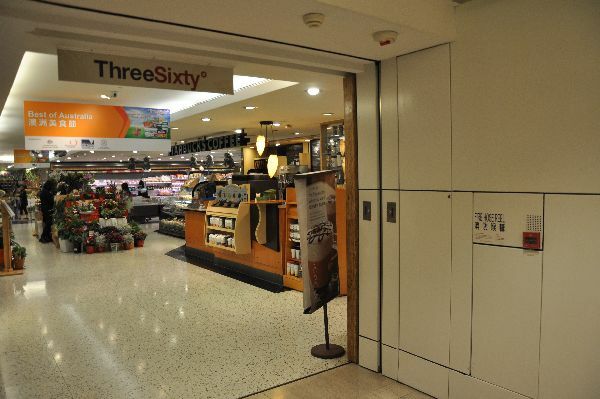 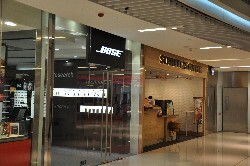 This very cool new concept store has something unusual, an express bar that faces the hallway of the shopping centre, completely separate from the full bar inside. 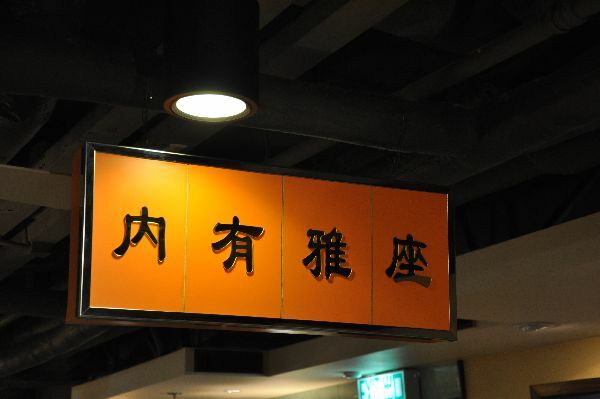 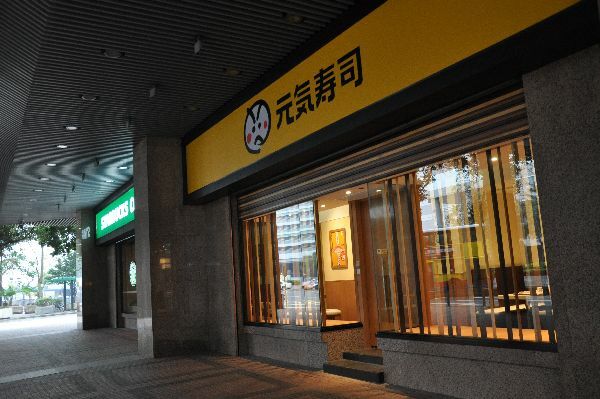 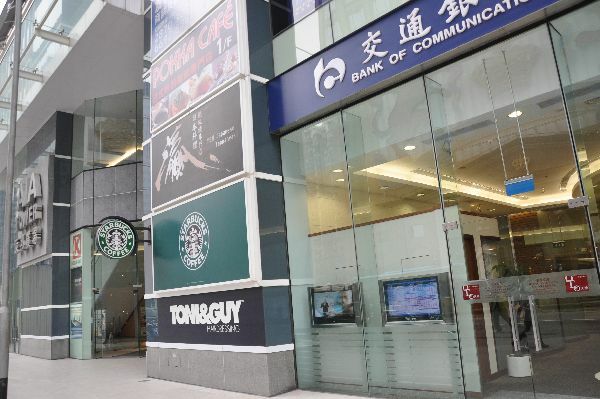 Another unusual feature is its diversity concept--most stores in HK are staffed by ethnic Chinese, but this one goes out of the way to hire some non-Chinse. 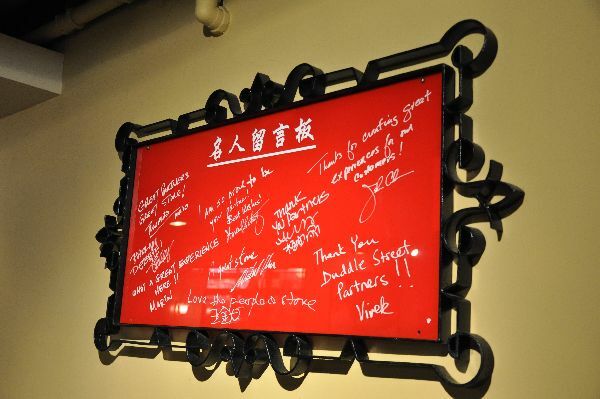 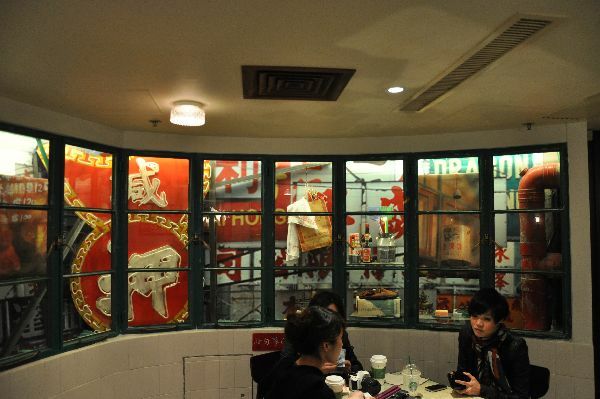 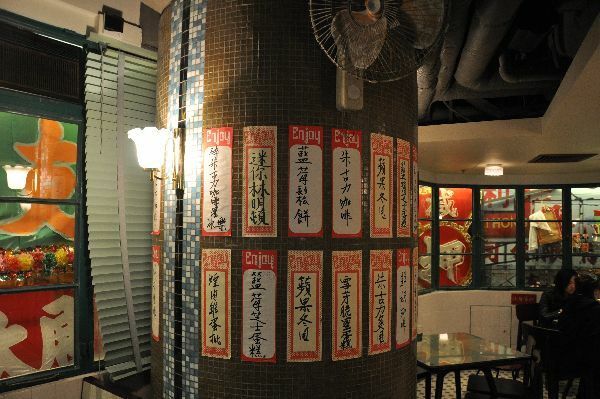 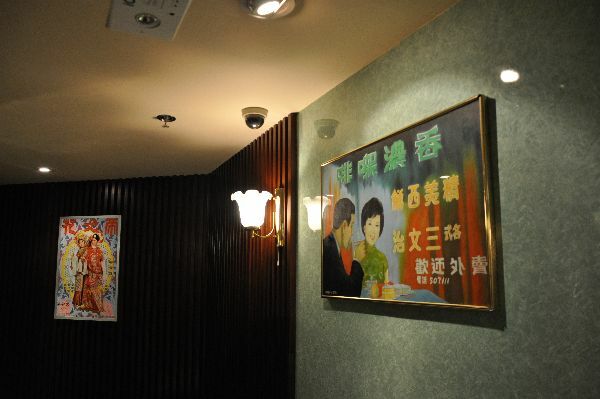 Cool decore include funky red tile on one wall, a large reddish reflective mirror slanting up the side of the main room, and a large picture window facing Nathan road. 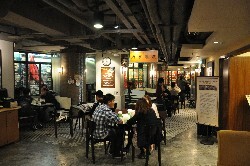 This lobby of this cute store is very small, but there is additional seating outside, with some very interesting and decorative floor tile. 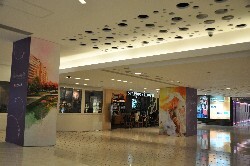 I'm not a big fan of malls, but LCX is actually pretty cool, with a vibe different from that of most malls I've seen. 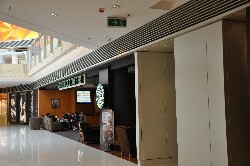 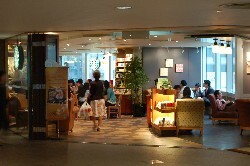 Inside the Yata department store. 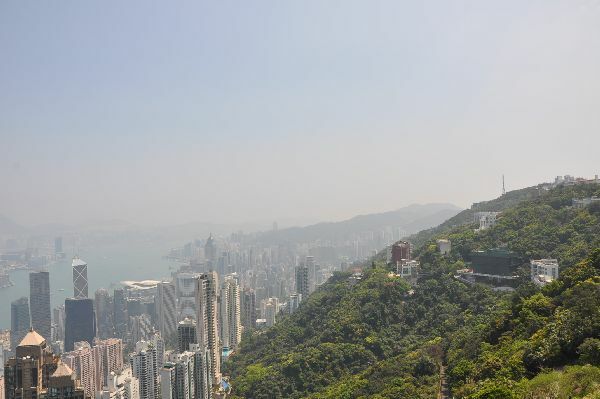 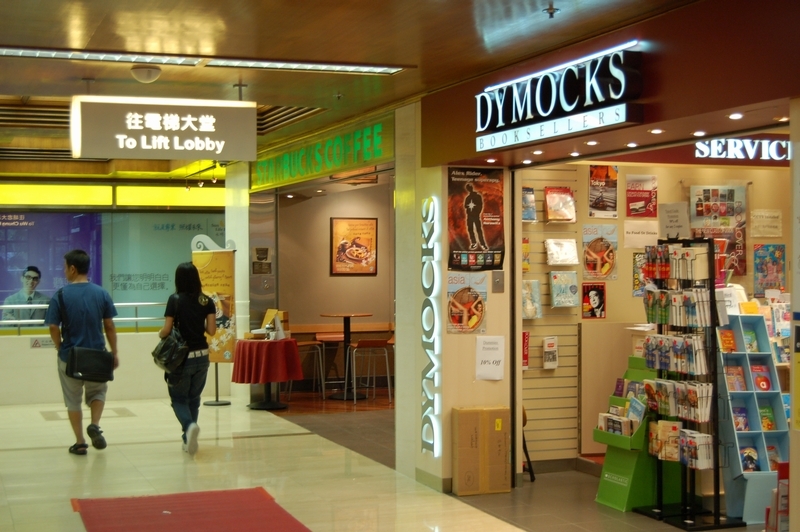 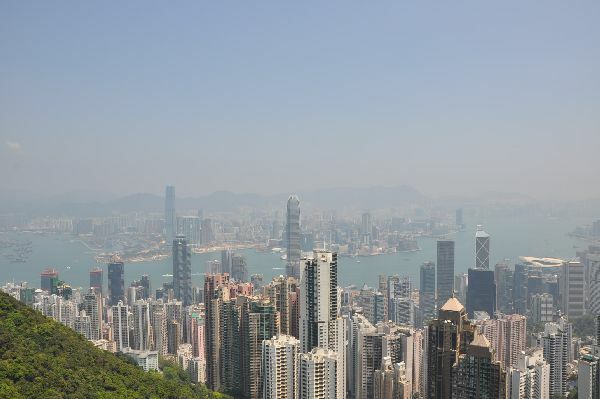 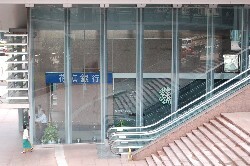 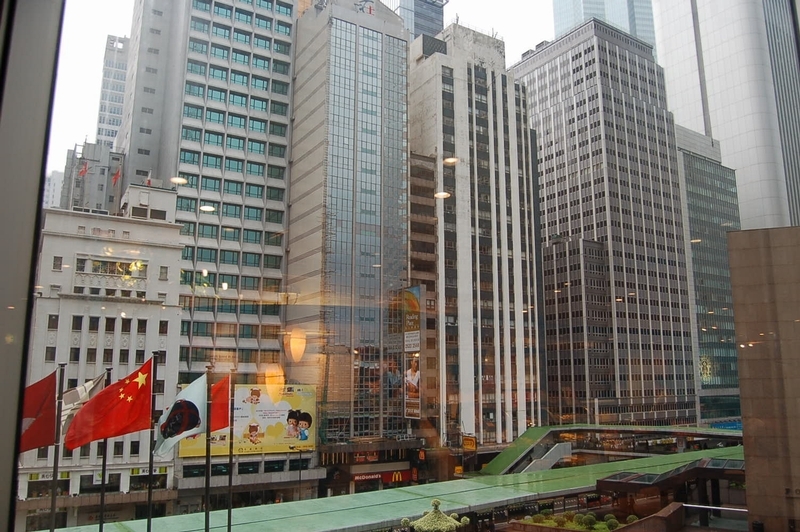 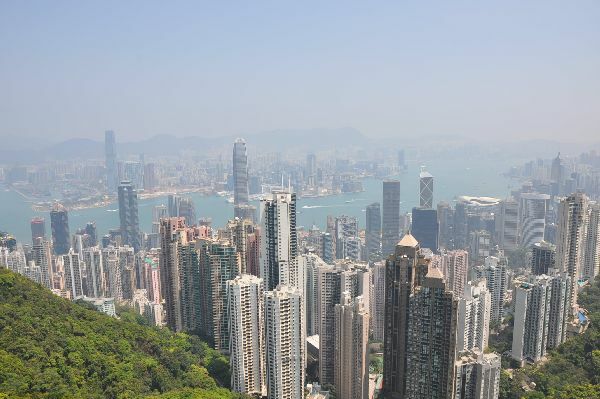 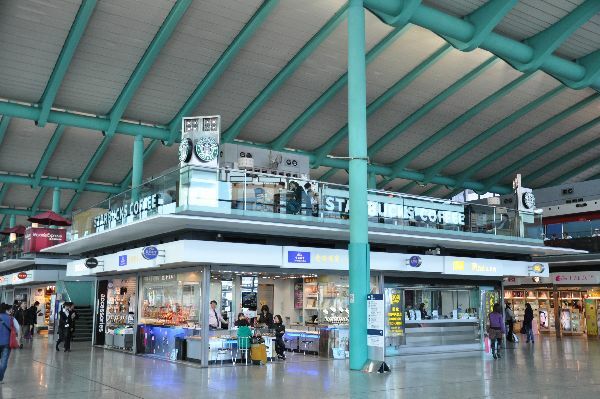 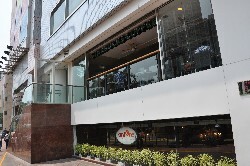 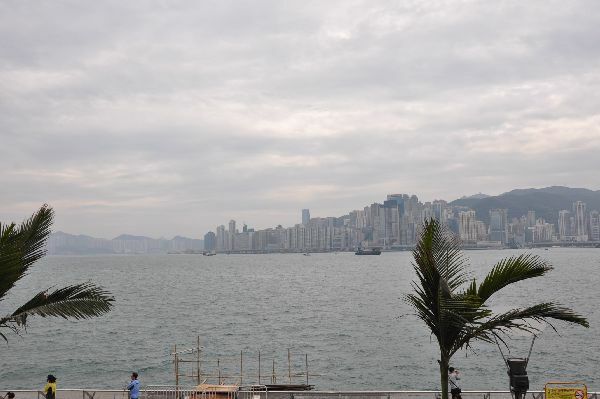 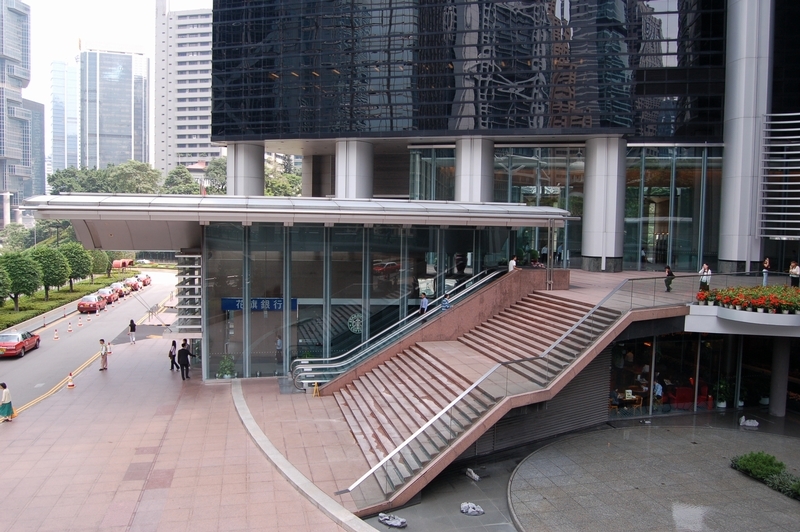 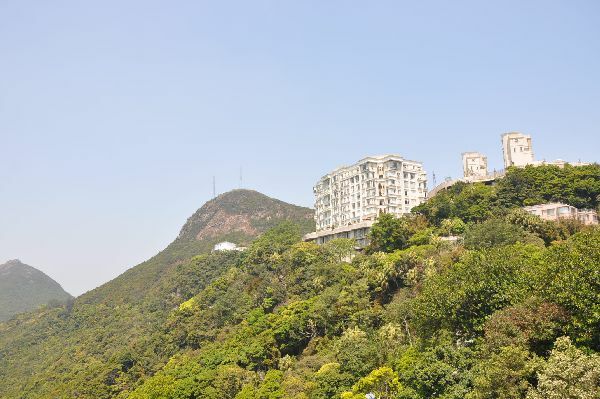 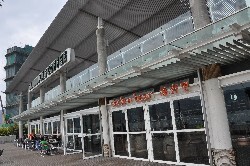 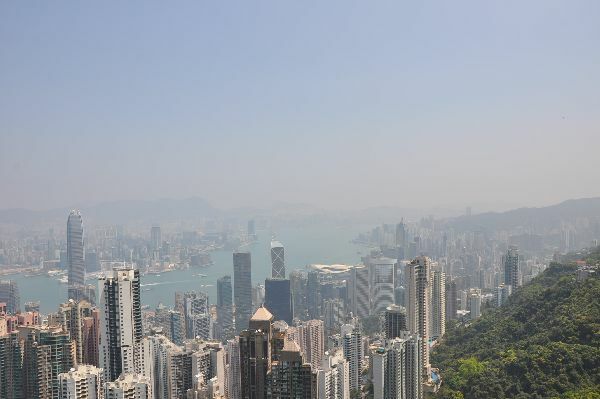 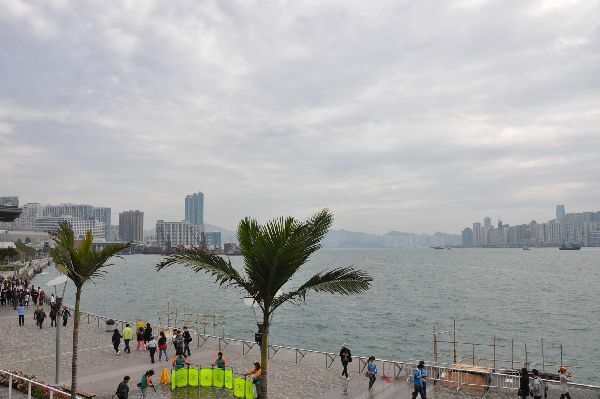 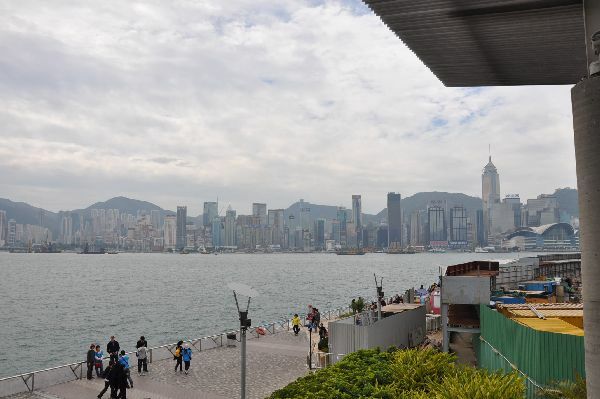 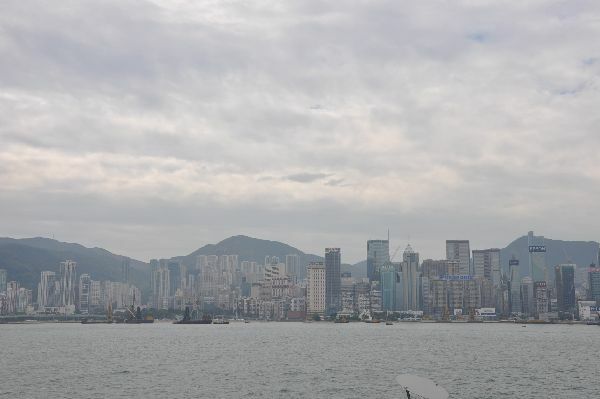 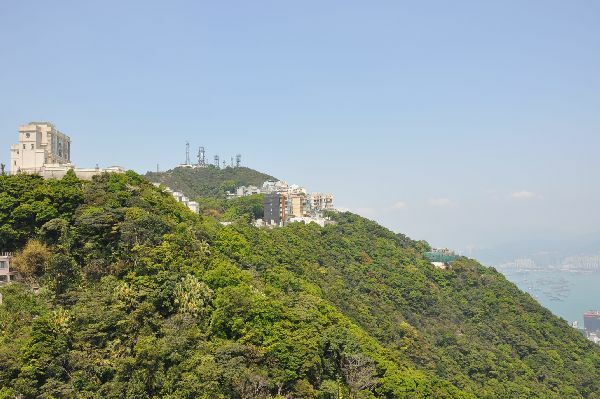 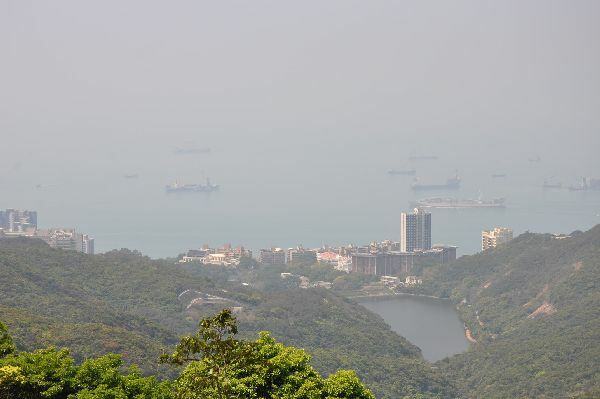 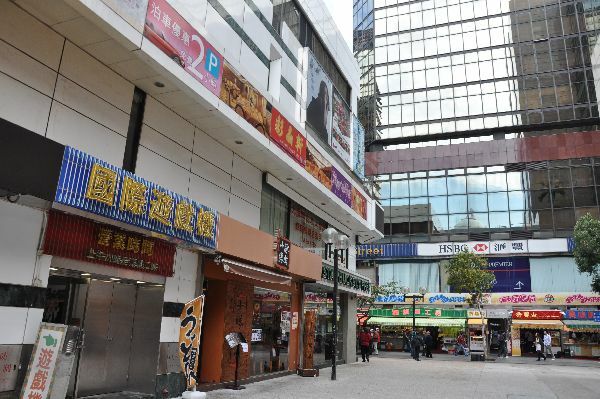 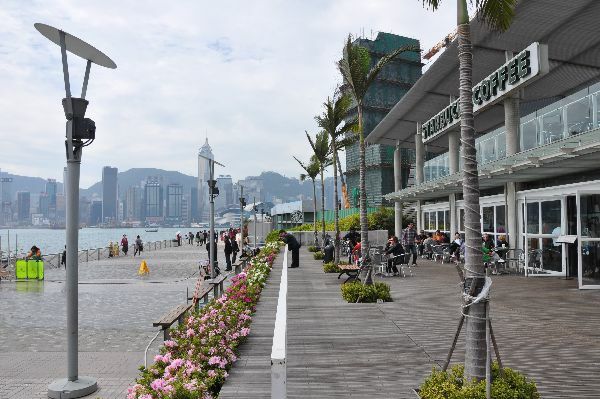 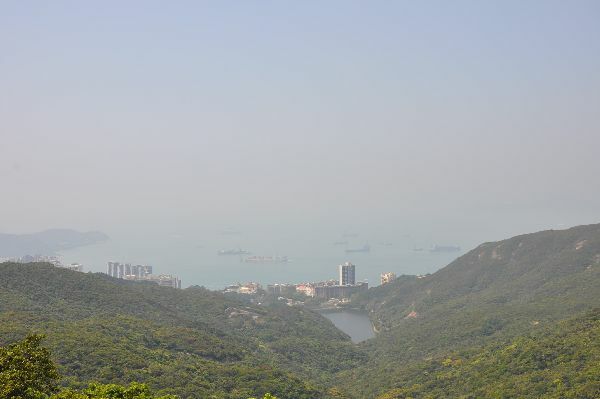 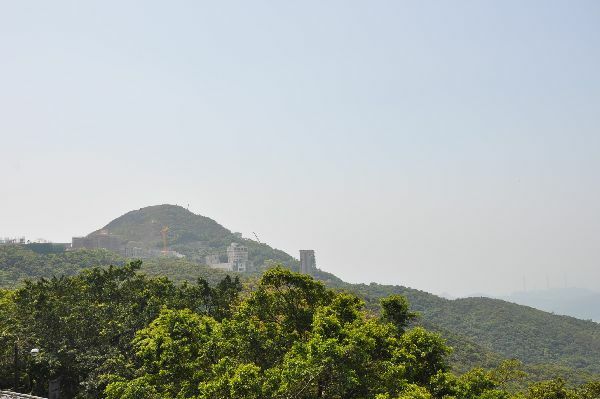 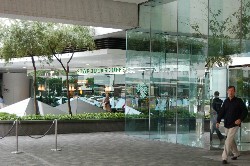 The store itself is fairly ordinary, but the free view to the right is great, and if you want to spend 30 HDK, walk over to Sky Terrace at The Peak to get a MAGNIFICENT view of the city. 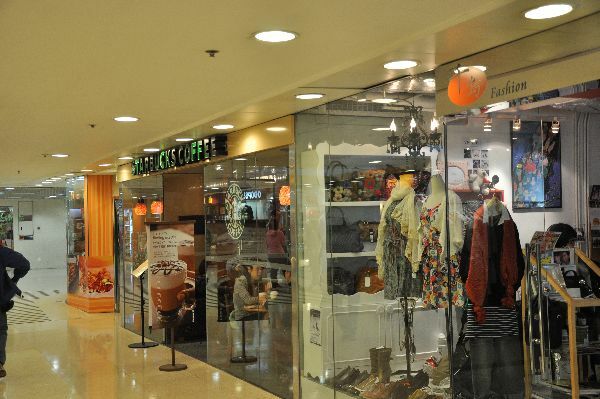 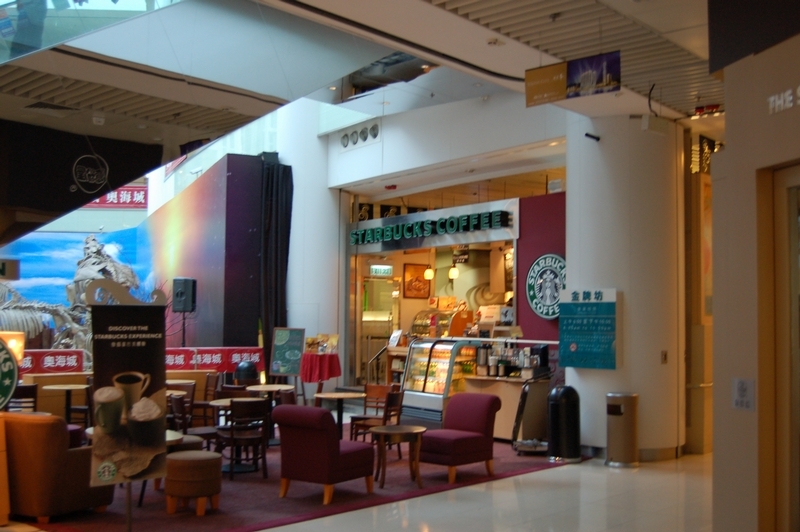 This mall store is busy enough to need an external seating area. 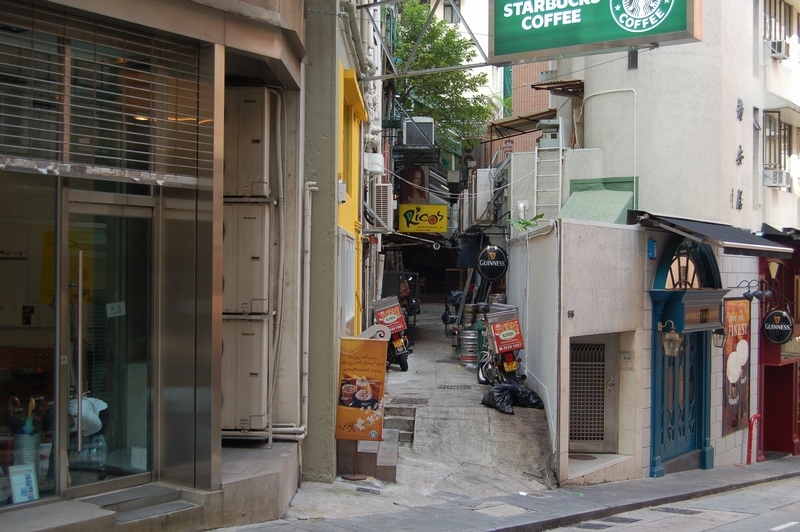 Good thing for that big sign, because otherwise this store, tucked into a corner, could be hard to see! 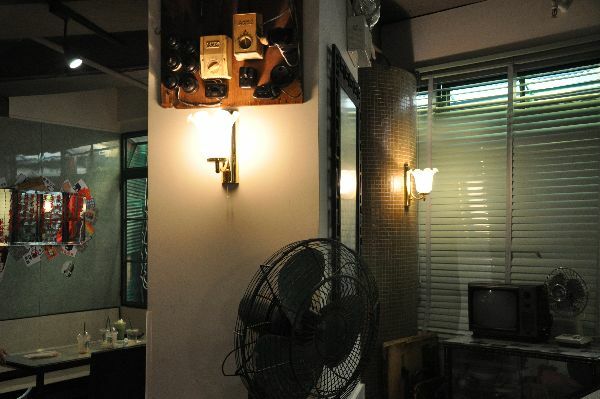 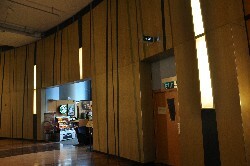 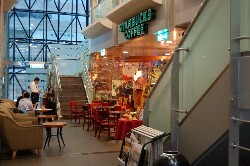 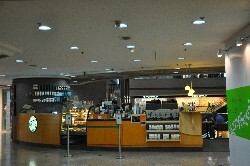 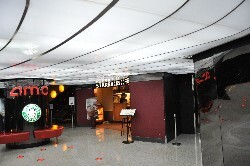 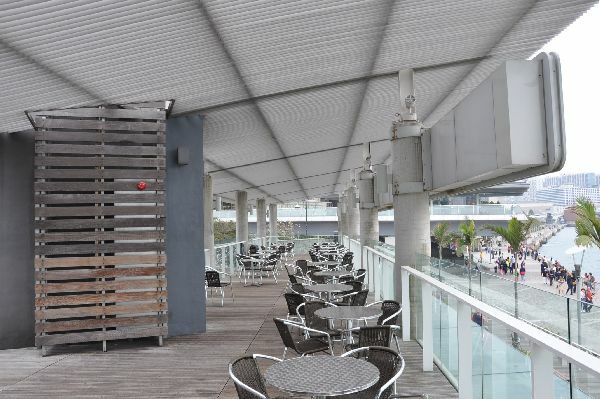 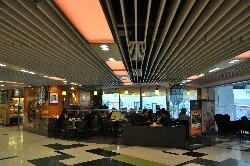 Because of the structure of the building, the seating area is separate from the bar--extremely unusual. 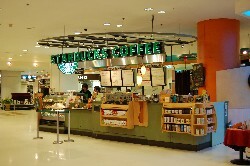 As of my visit, this was the only kiosk inside a supermarket. 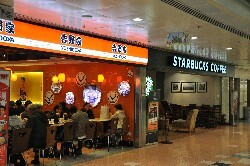 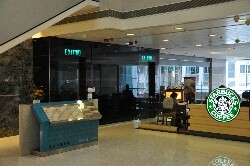 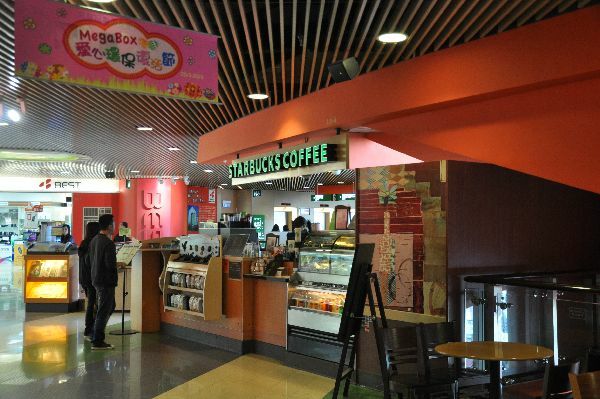 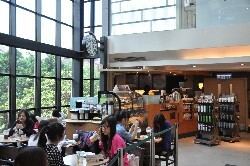 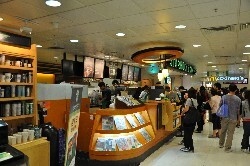 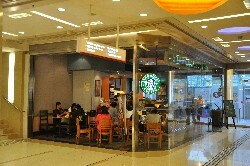 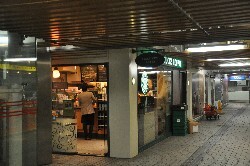 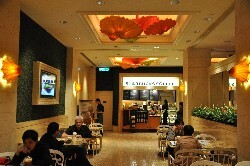 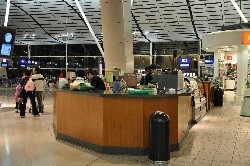 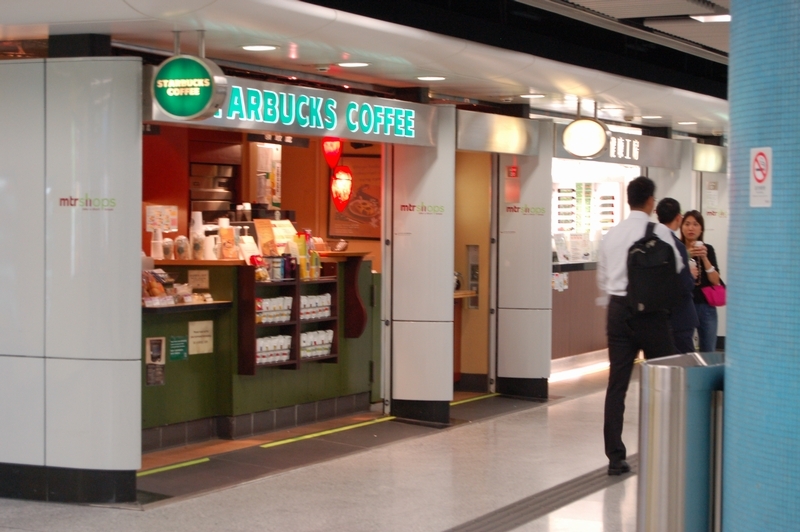 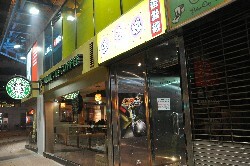 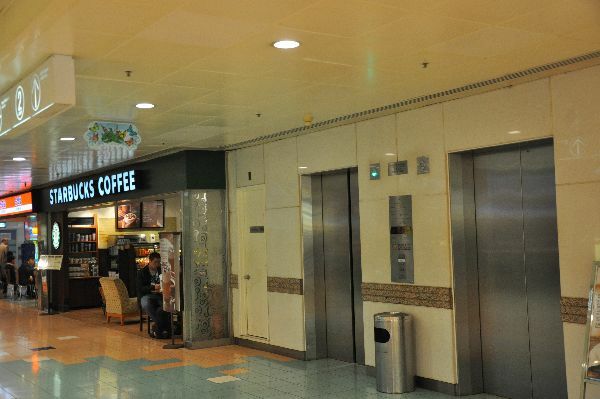 Unlike all such kiosks in America, this one is real, run by Coffee Concepts just like all the others in HK. 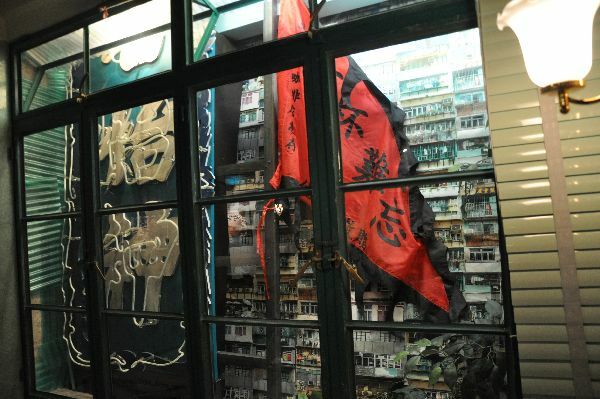 Another unusual thing--this store allows regulars to keep their tumblers on a shelf so they don't have to remember to bring them in! 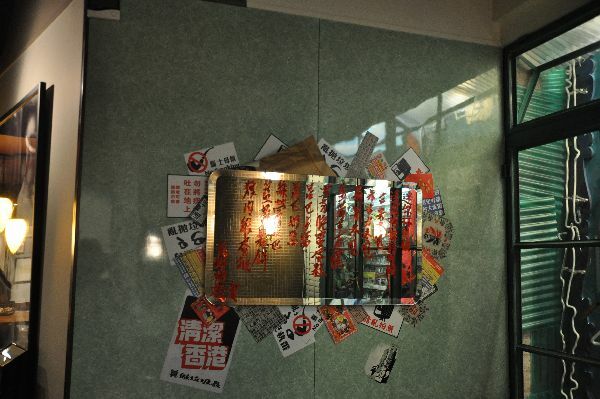 This one is on the 9th level, of at least 14--the most stories of any shopping center I've ever seen. 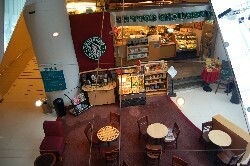 This store in an office tower is unusual for having two levels. 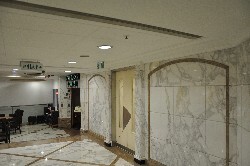 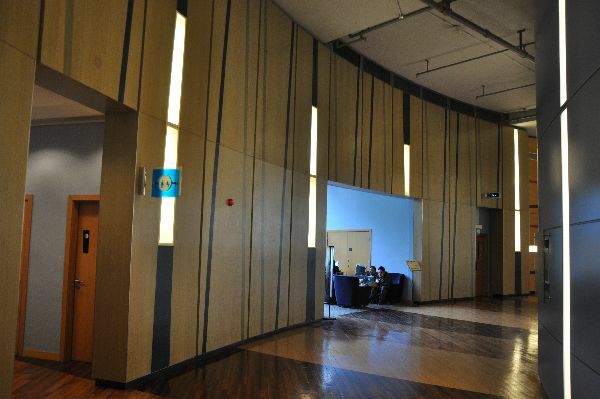 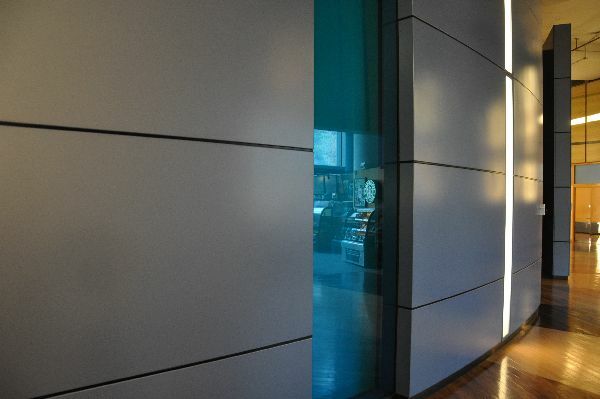 The second level has a wall-to-wall mirror, great for egomaniacs like me. 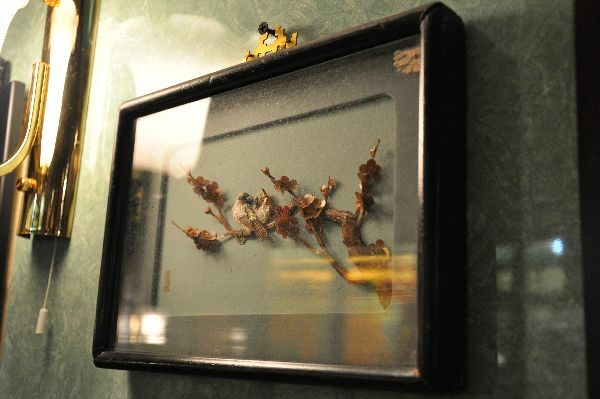 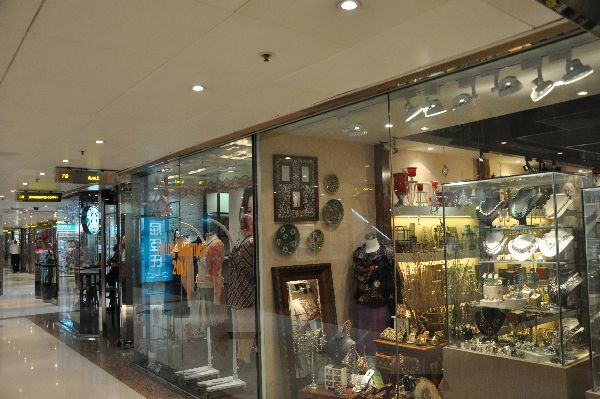 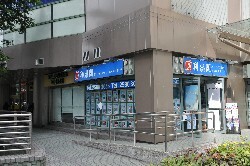 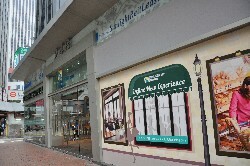 This relocated store now displays a changing gallery of art from local artists. 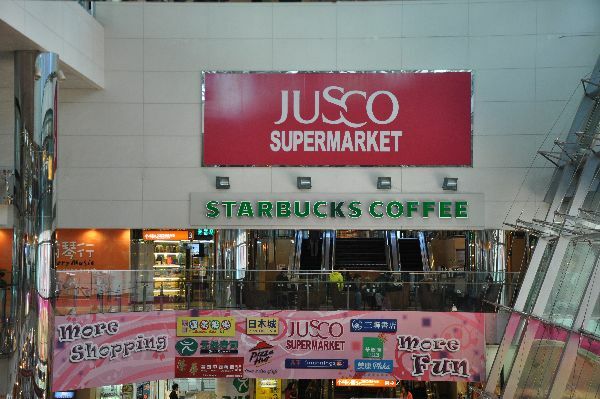 When you visit this store, make sure to look across the intersection... you'll find a surprising sight. 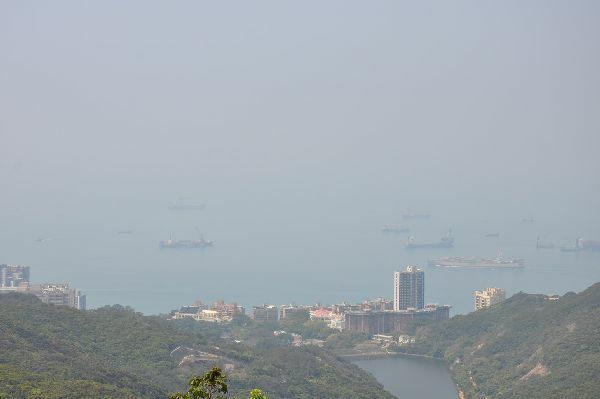 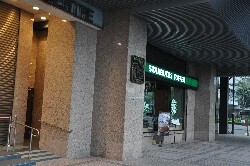 Legend has it that a l i e n s deposited that ship there! 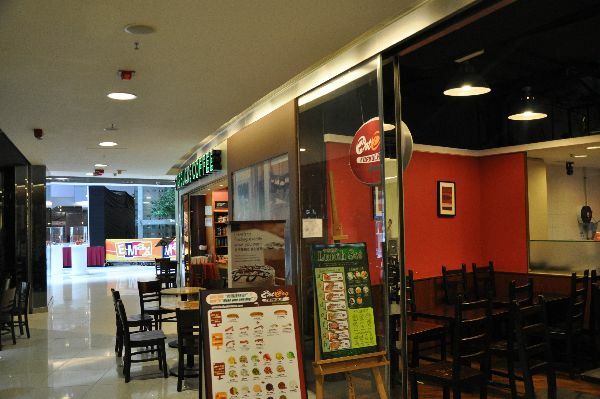 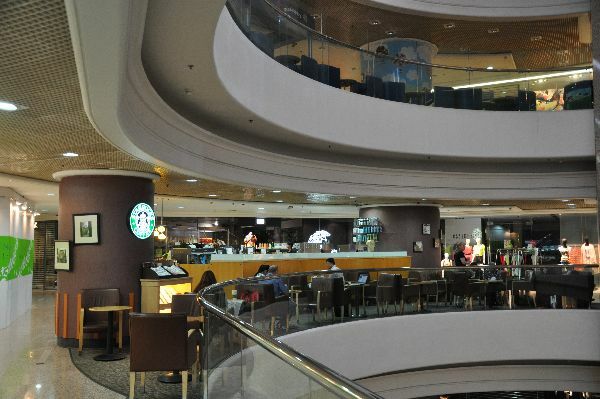 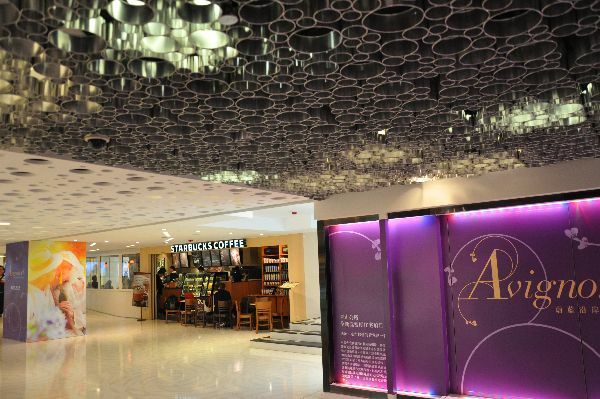 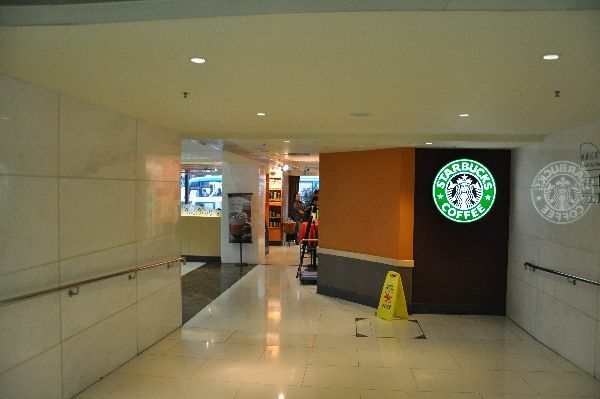 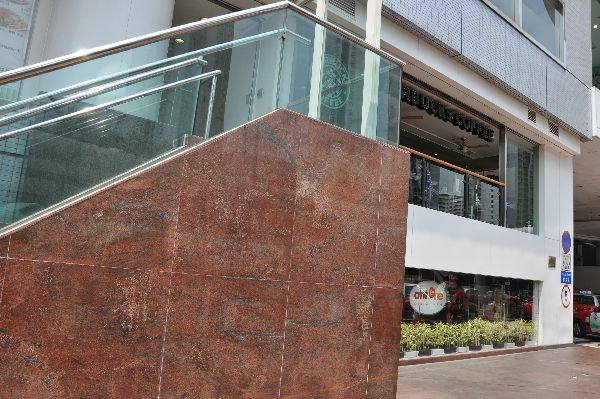 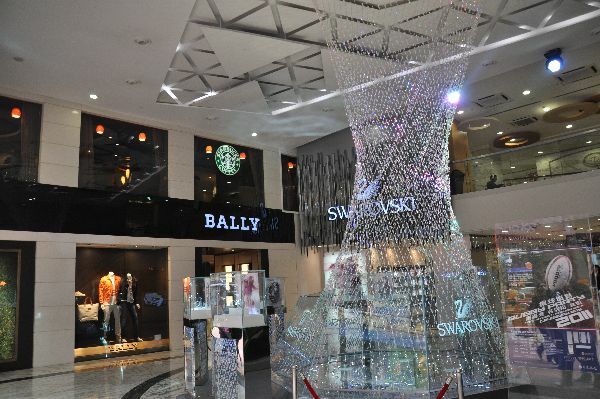 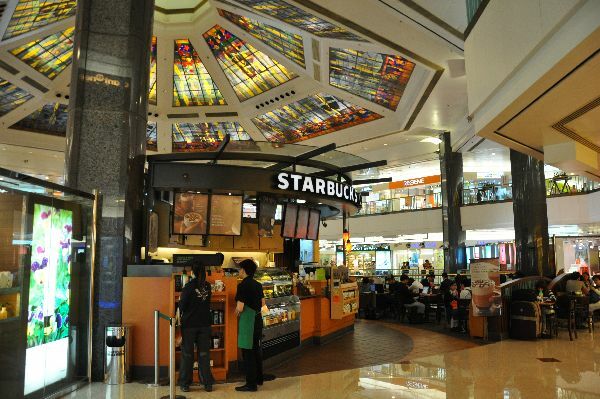 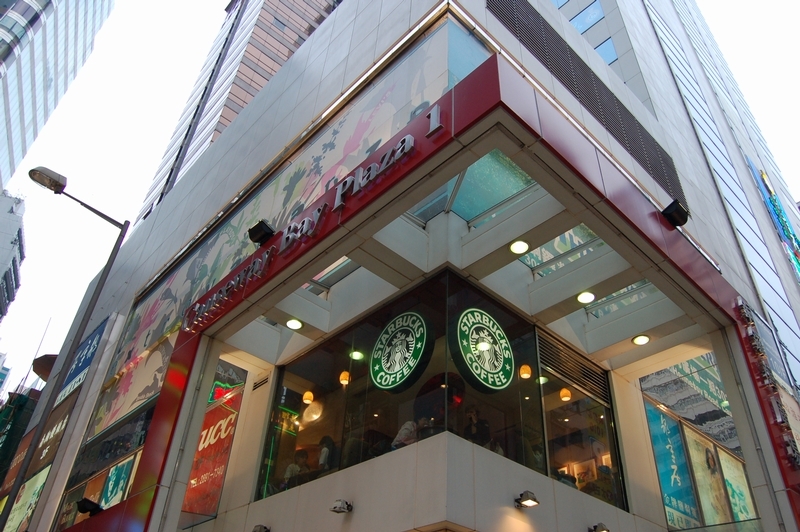 Wow--I thought I had seen everything when I visited the two stores at the 10-STORY Times Square mall in Kuala Lumpur, but this mall has TWENTY LEVELS!!! 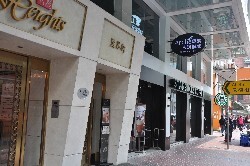 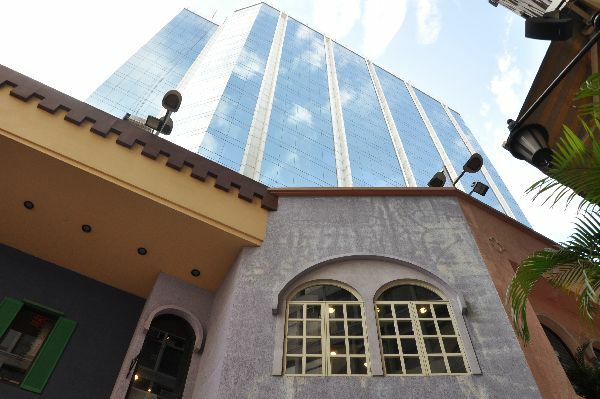 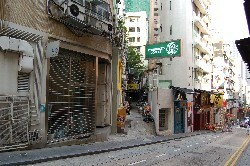 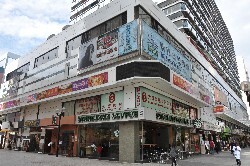 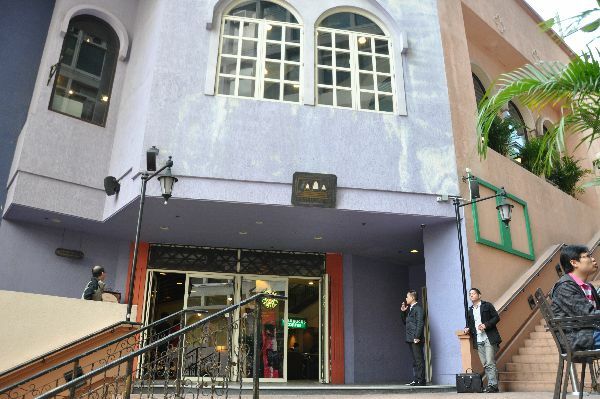 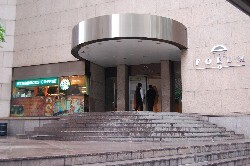 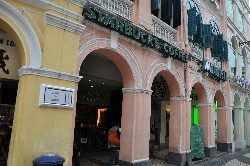 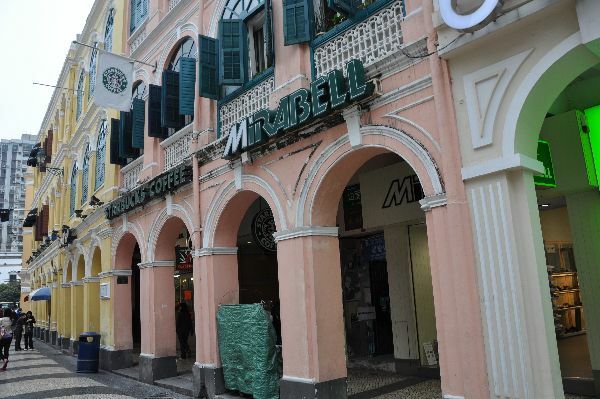 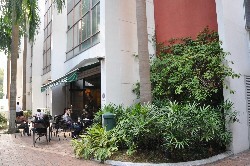 Of the four (as of this writing) stores in Macau, this is the only one that features Portuguese architecture. 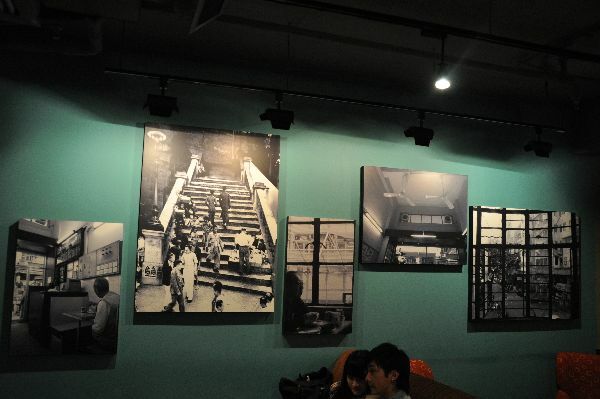 Make sure to go upstairs and enjoy the room with the open windows, and be sure to look around for the multitude of old photographs on the walls. 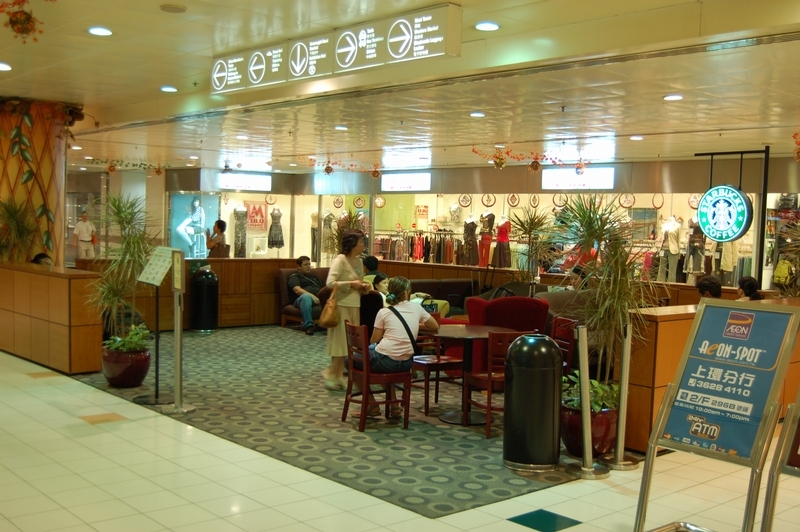 This store, next to the casino, has a faux-bamboo decoration right in the middle of the floor. 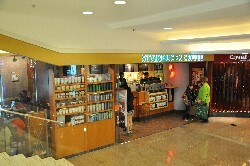 This store, on the casino floor, is unusual, possibly unique, because it is the only one where I had to check my backpack before I could visit. 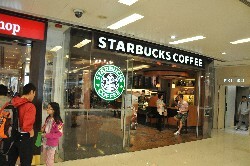 This store is dedicated to Karen! 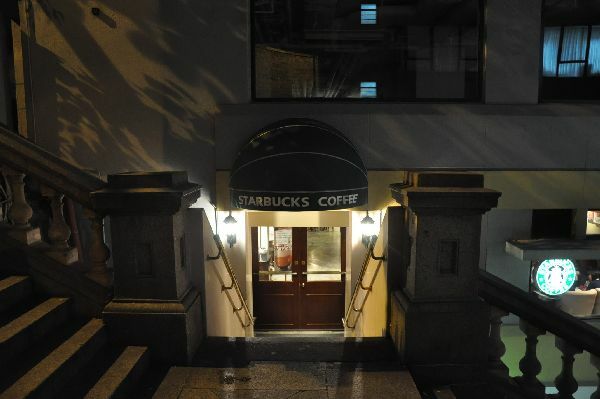 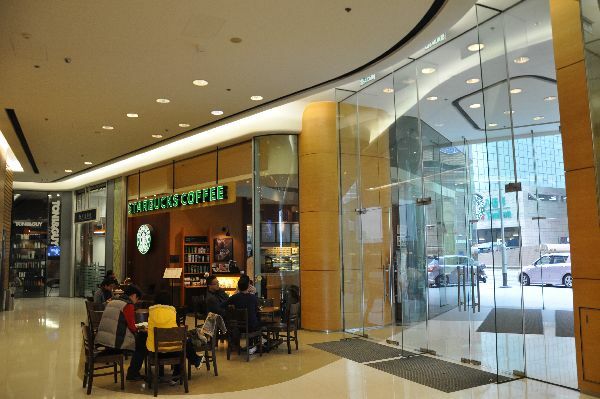 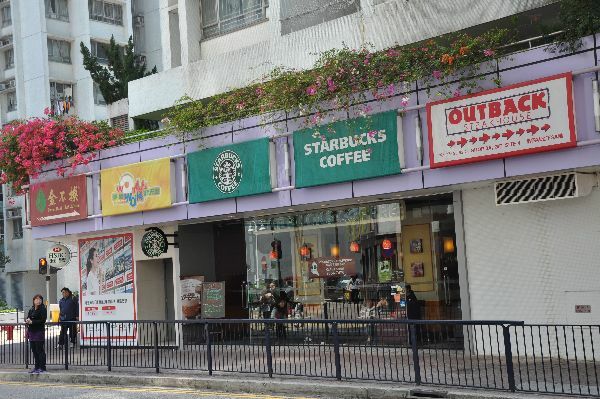 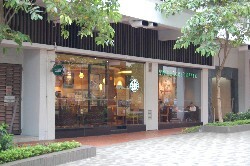 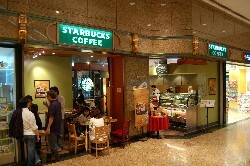 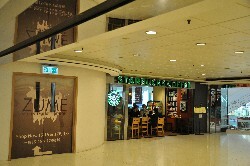 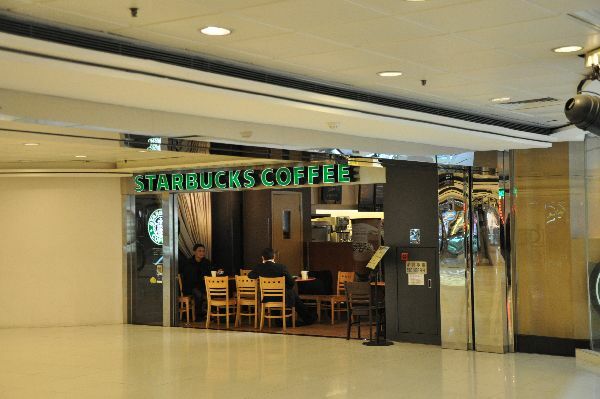 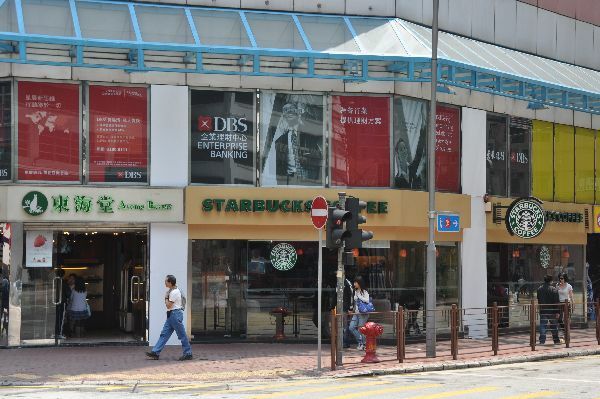 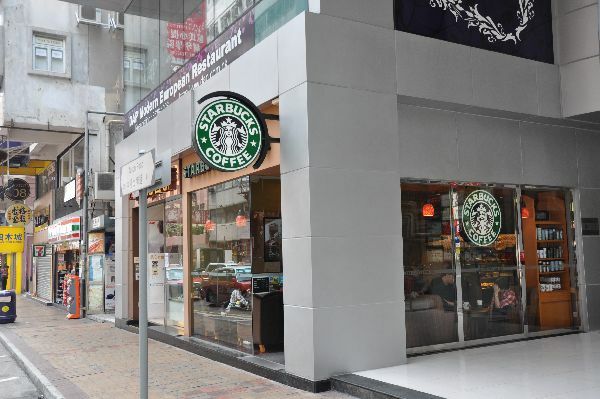 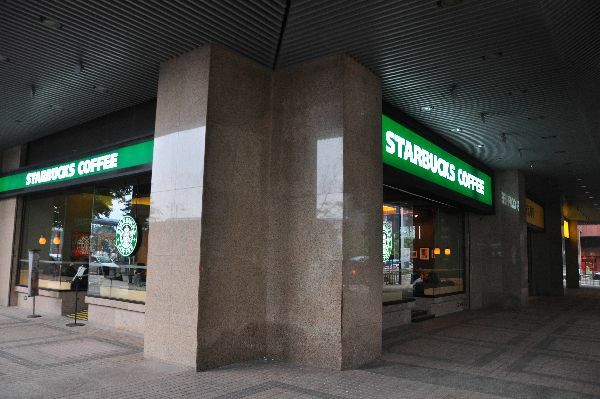 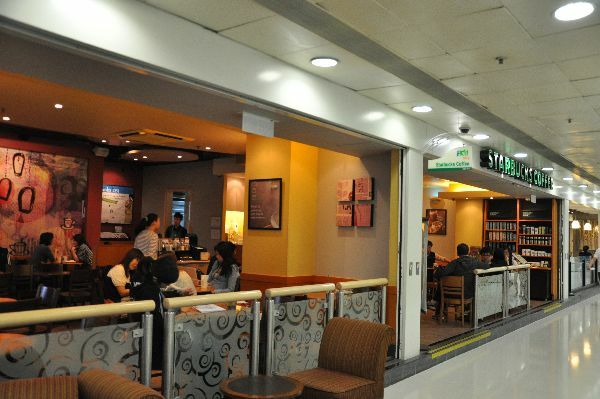 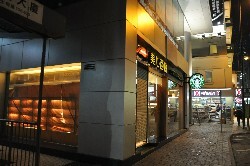 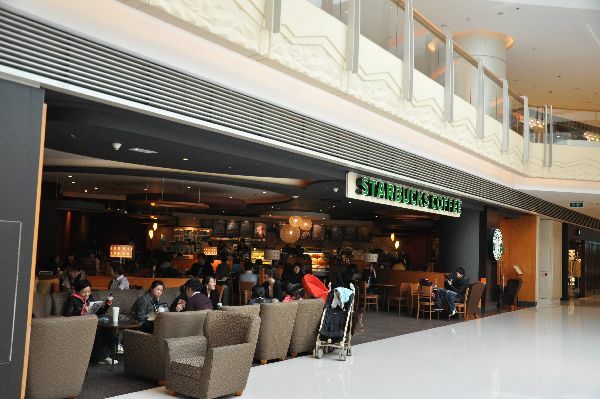 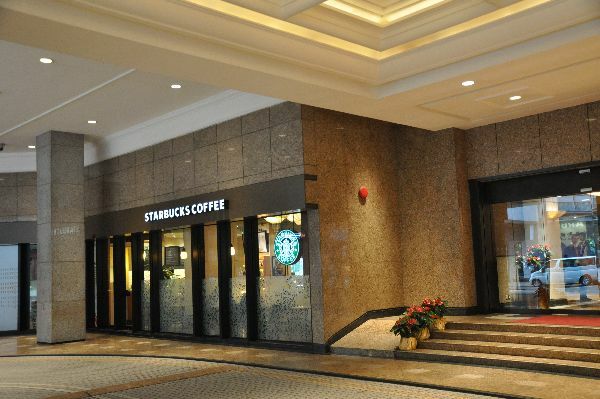 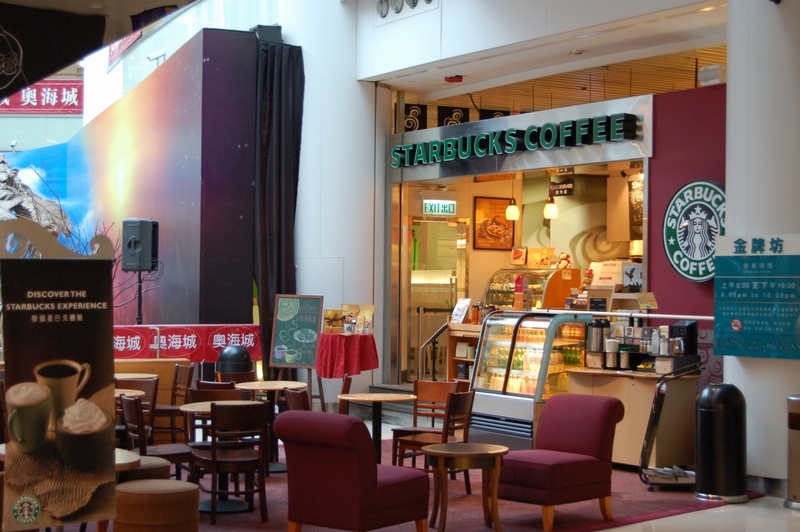 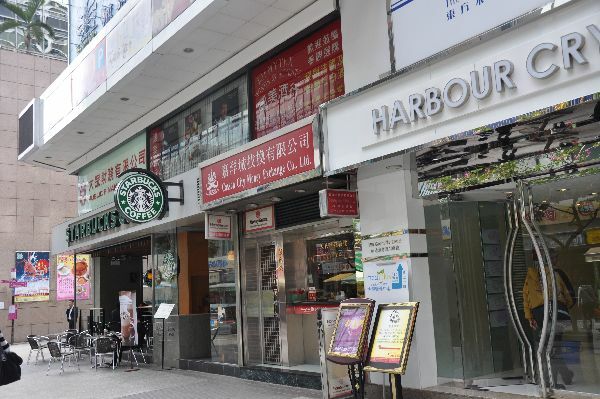 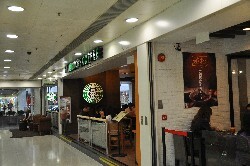 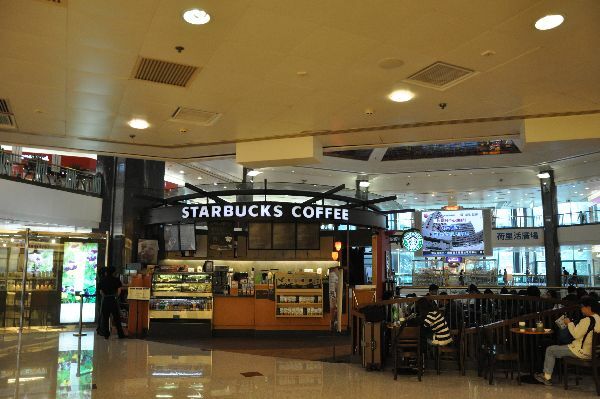 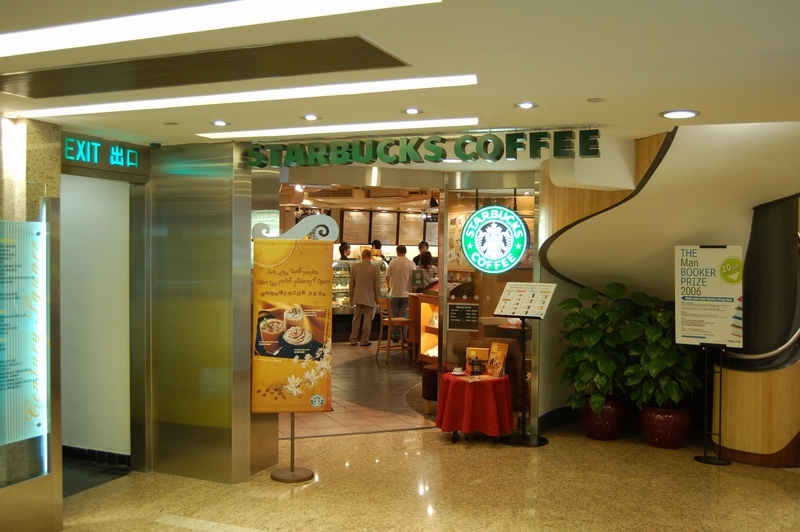 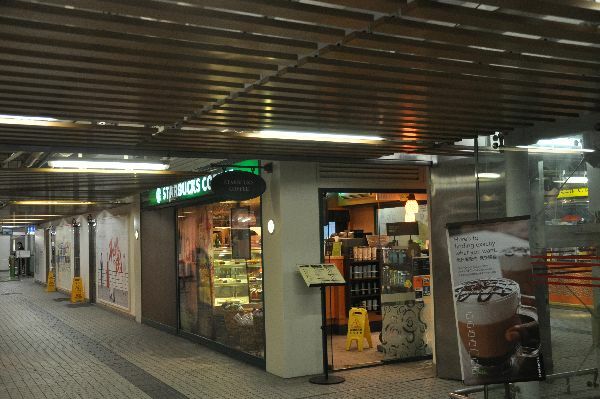 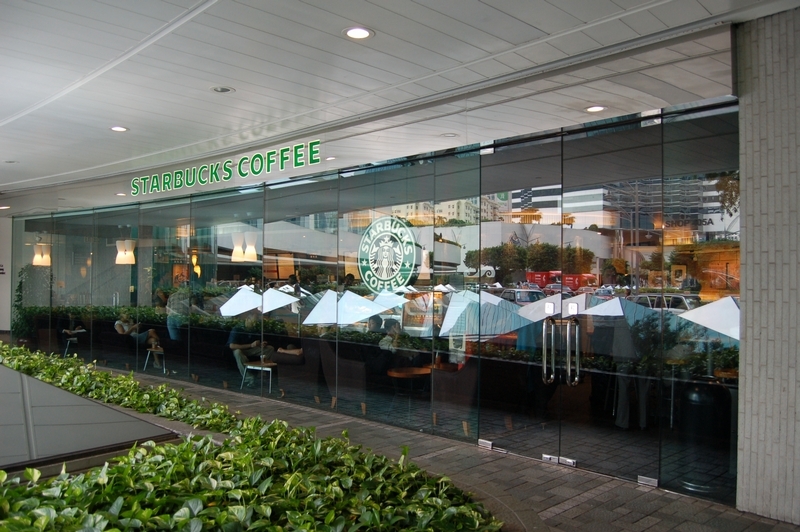 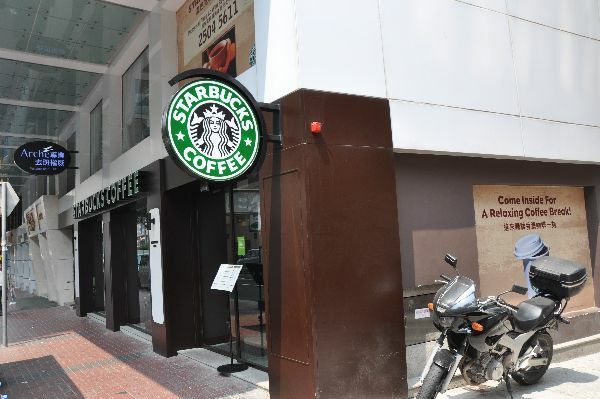 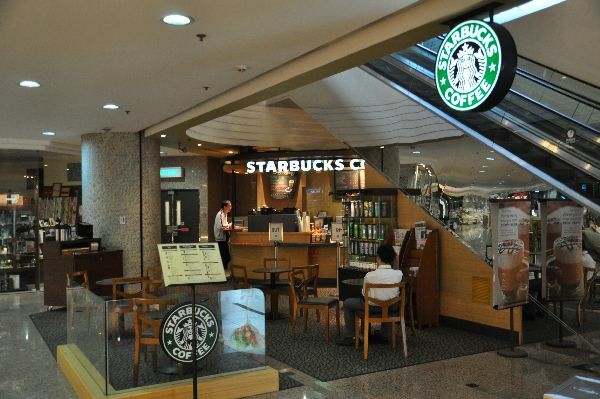 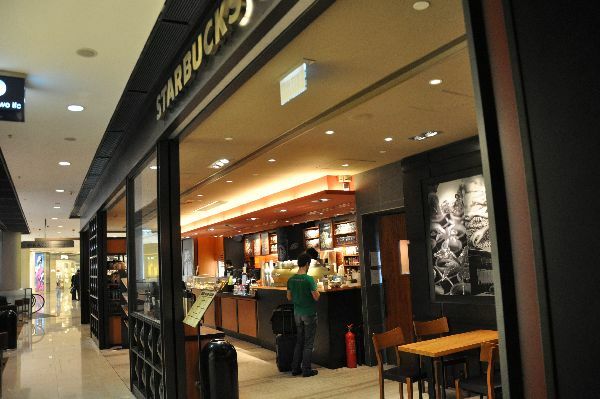 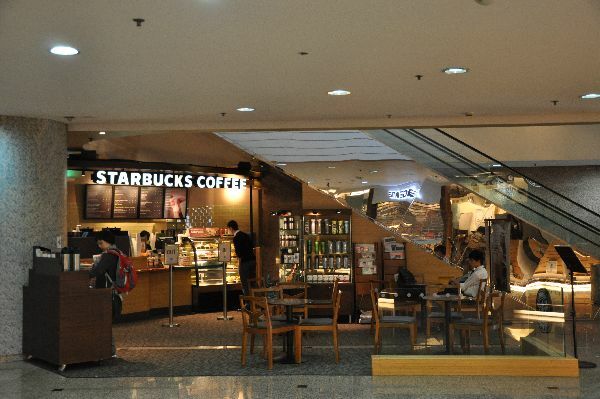 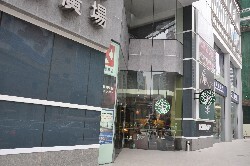 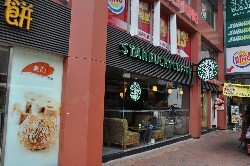 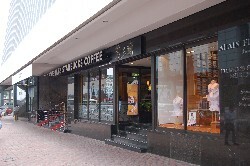 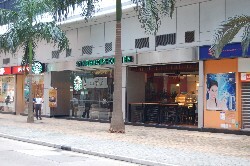 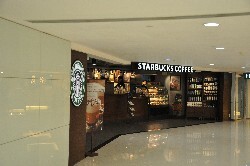 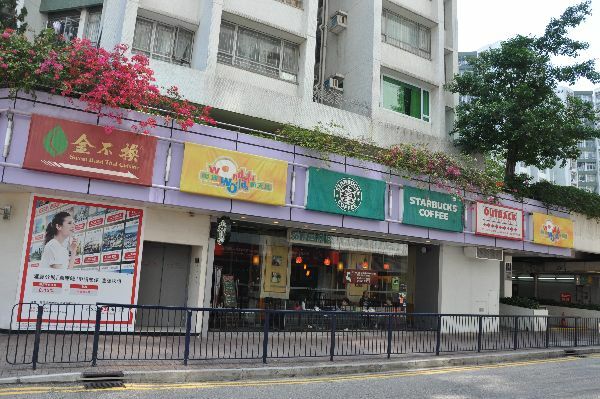 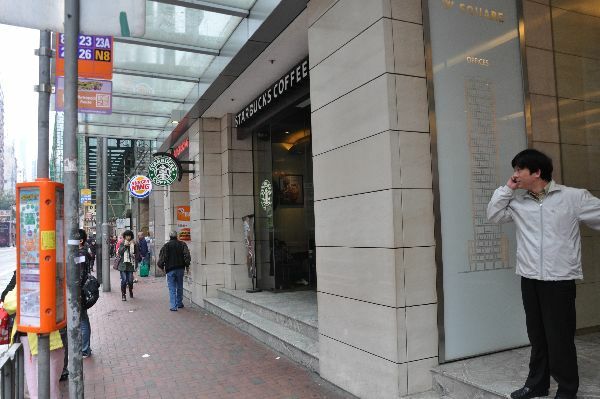 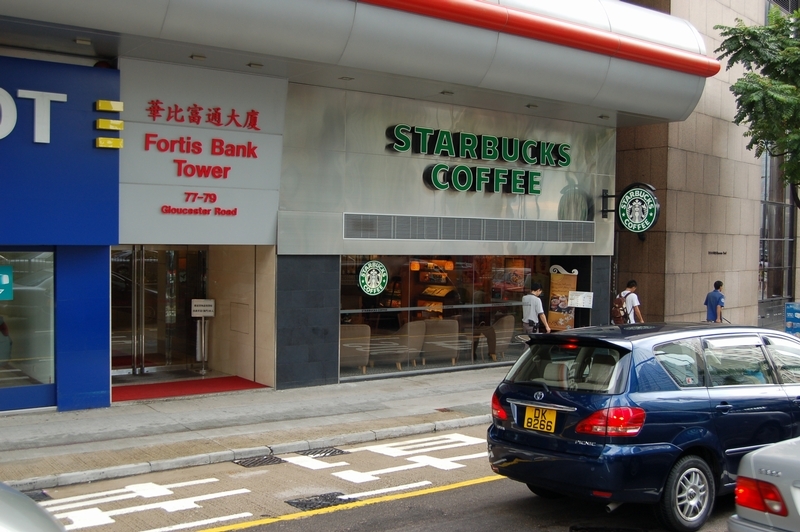 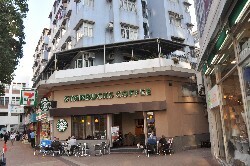 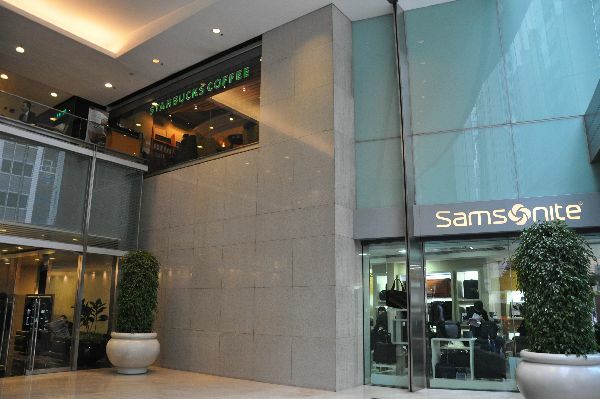 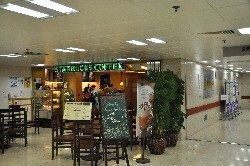 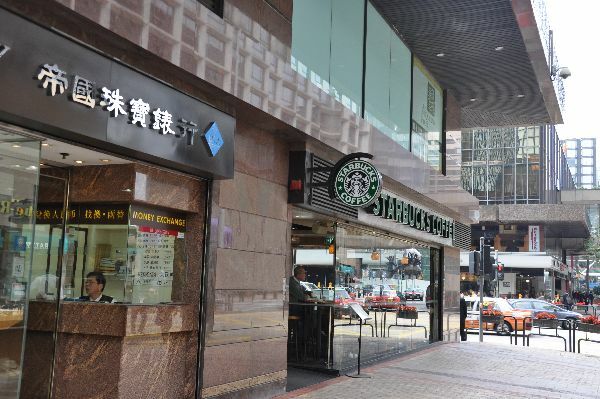 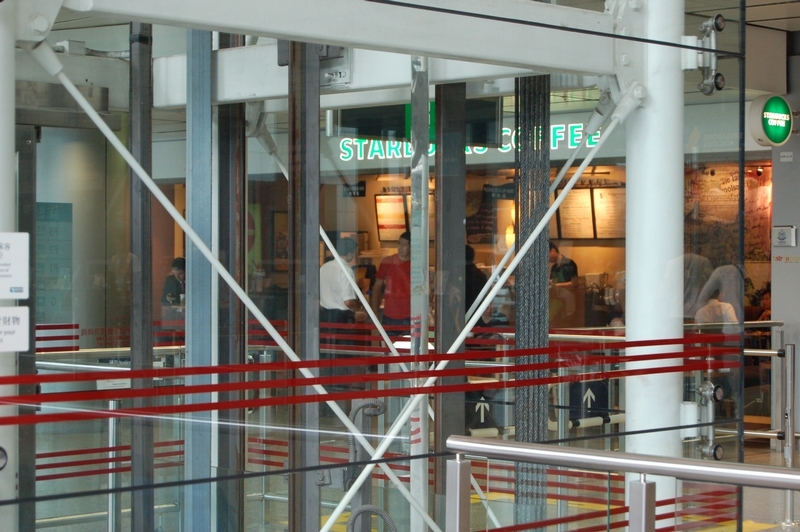 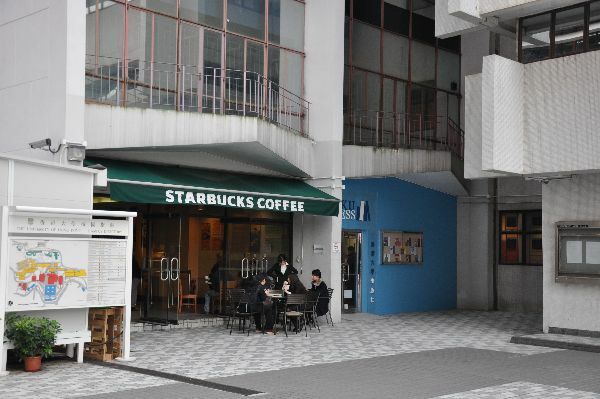 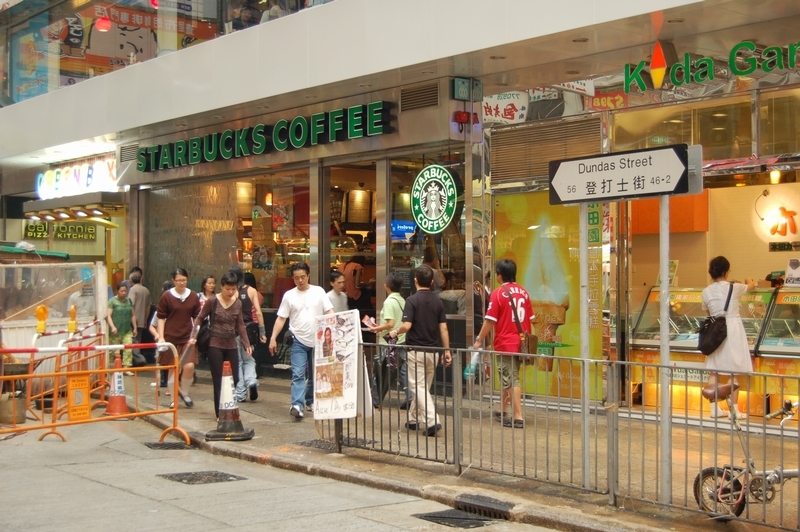 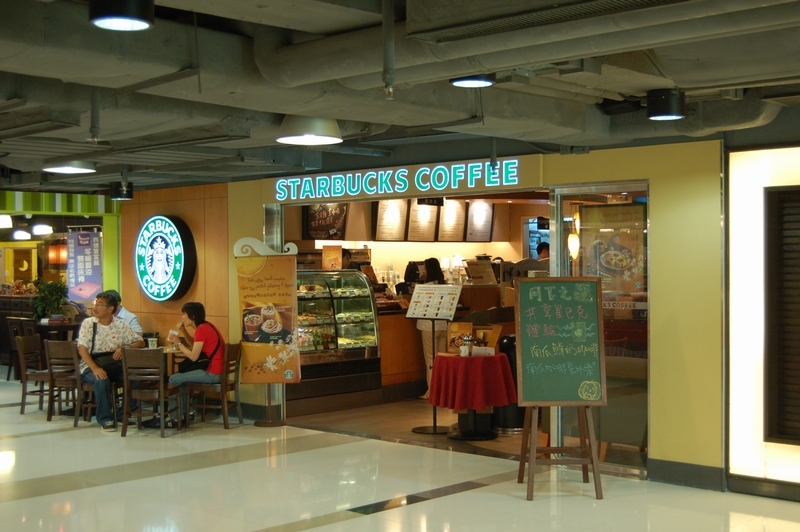 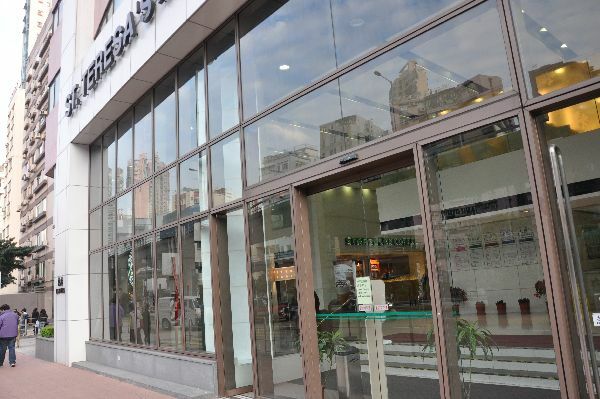 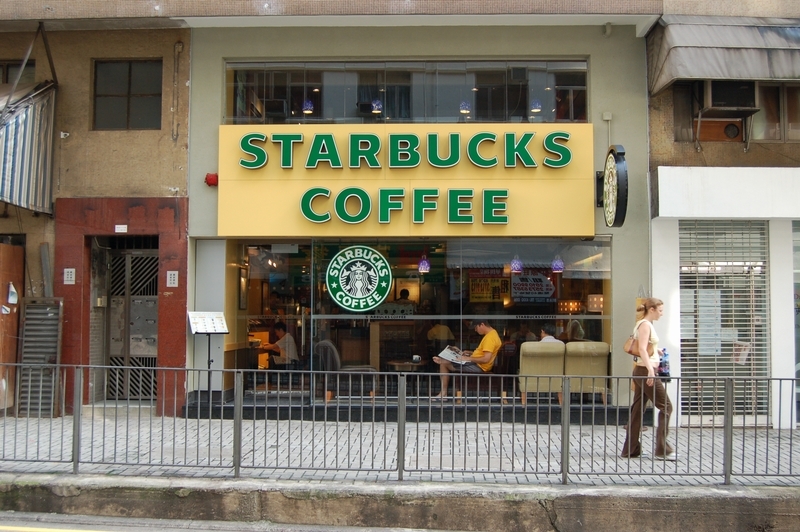 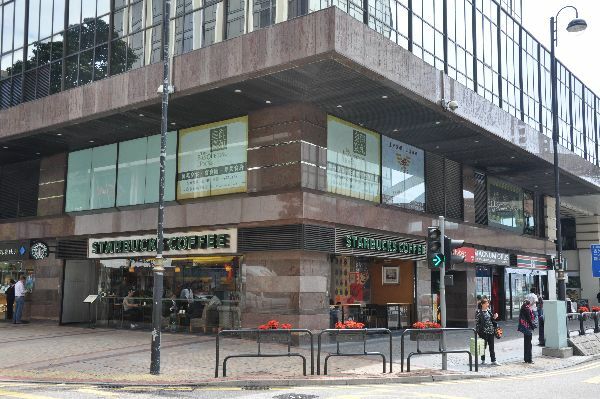 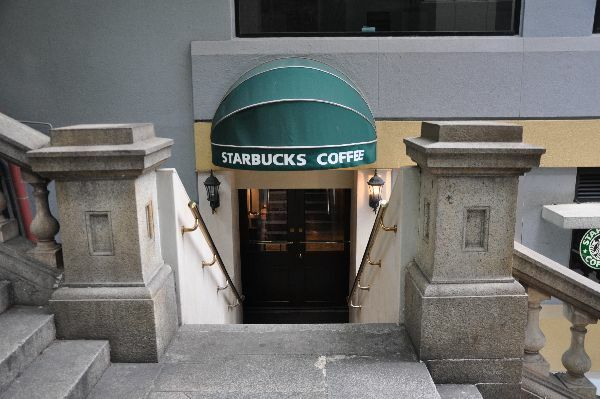 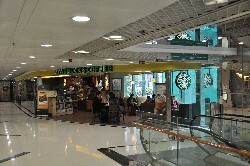 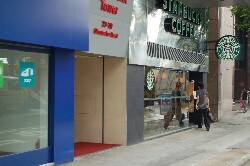 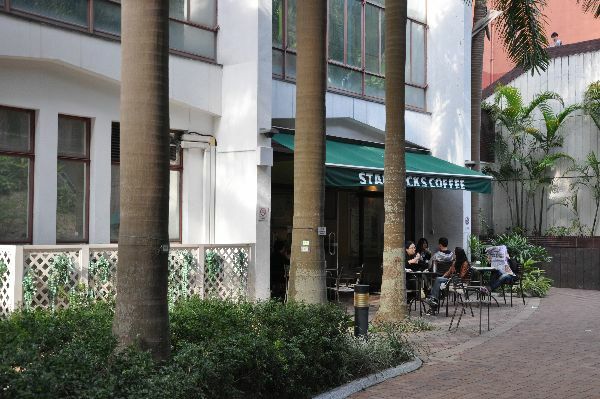 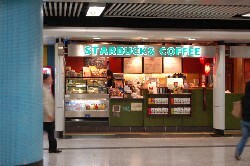 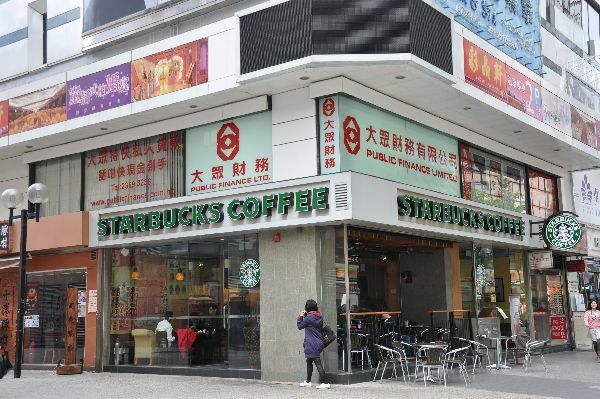 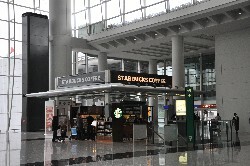 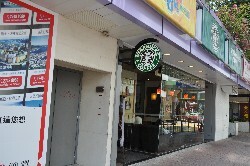 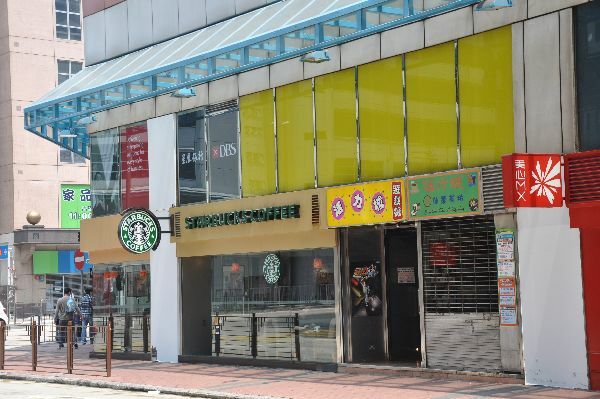 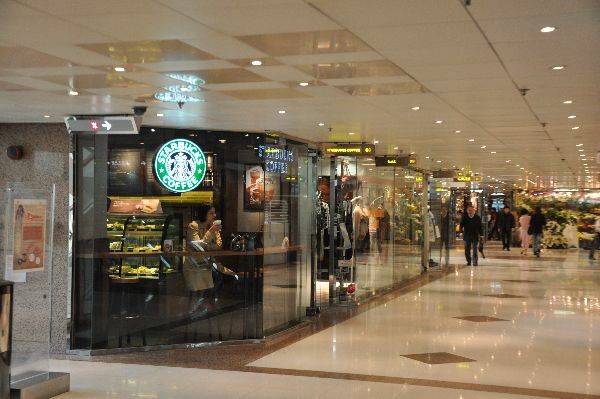 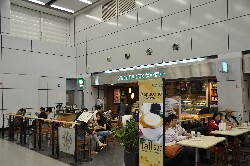 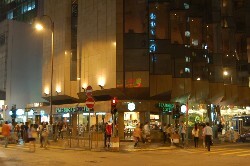 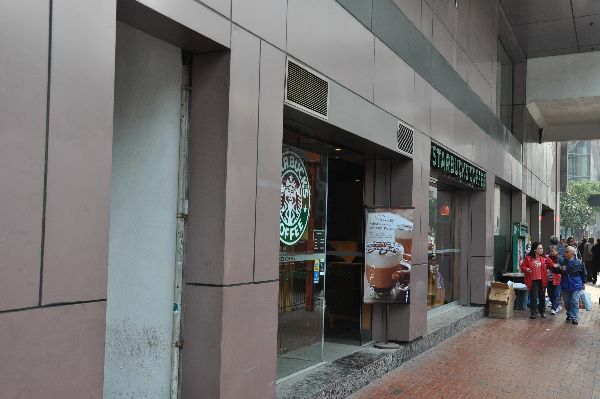 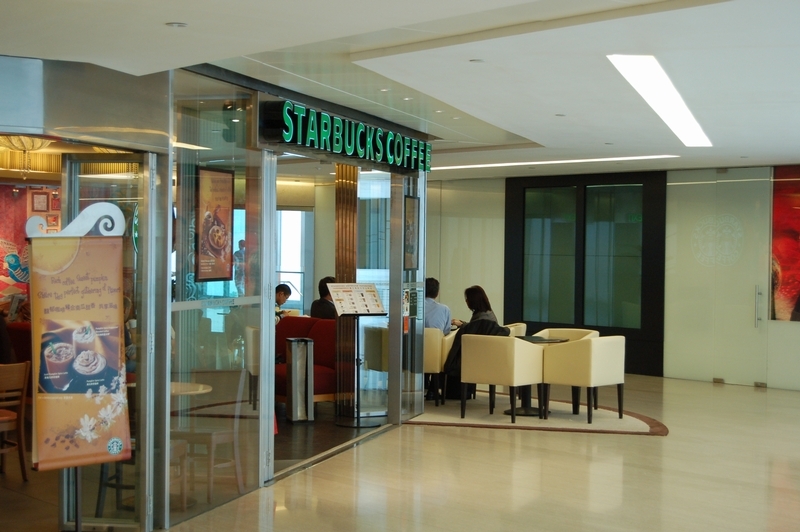 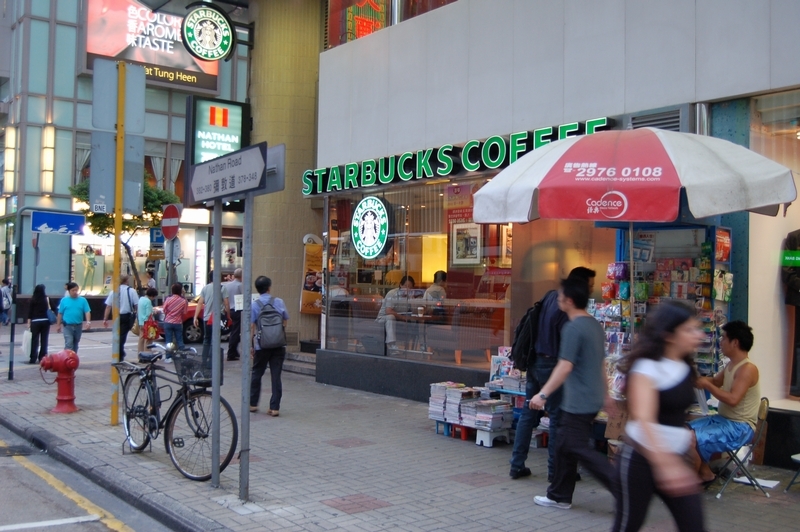 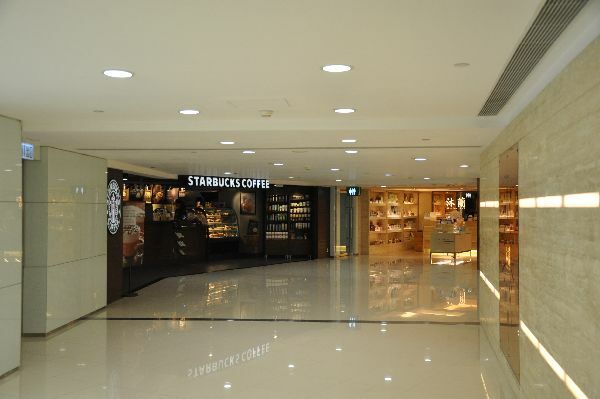 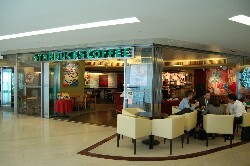 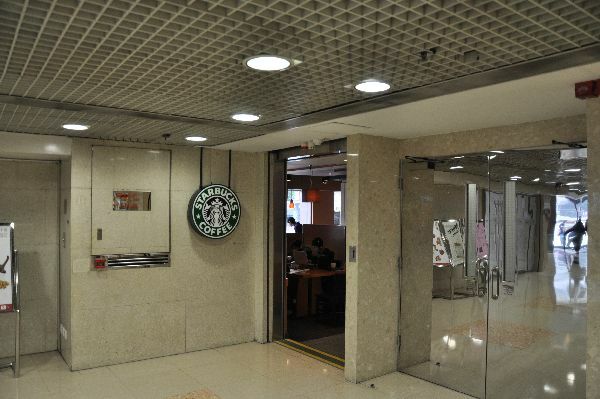 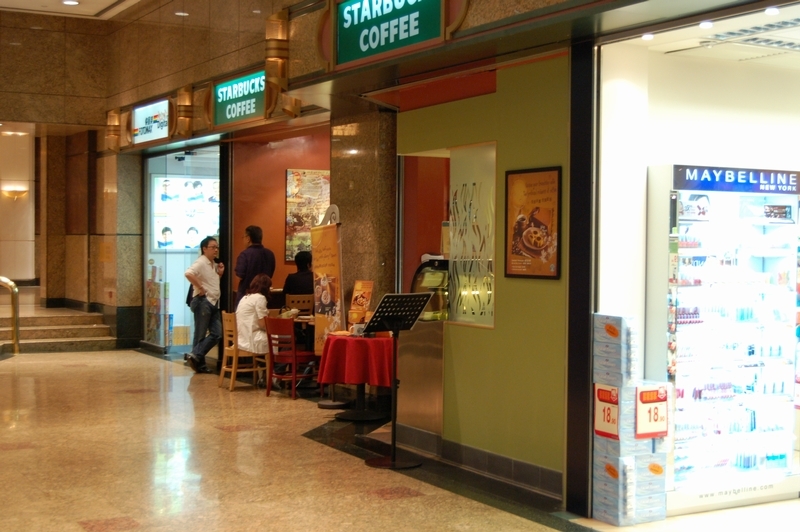 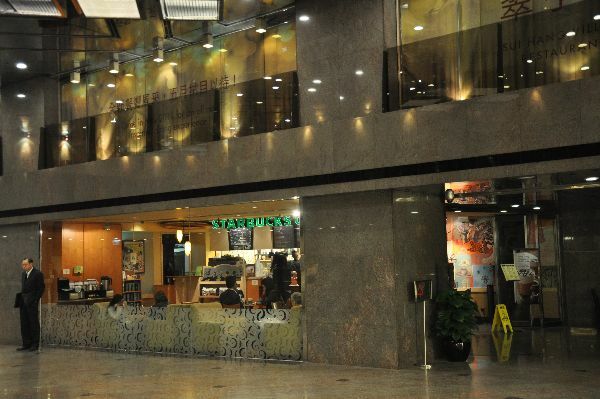 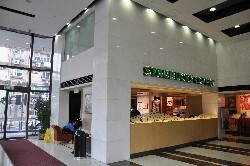 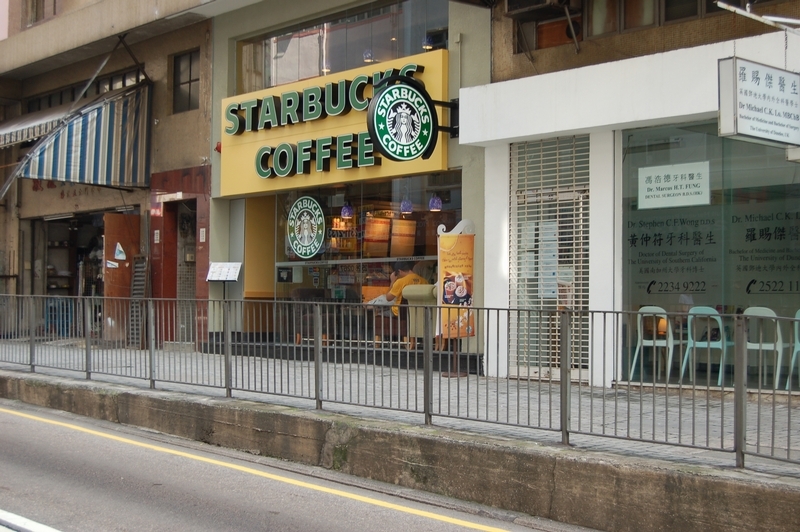 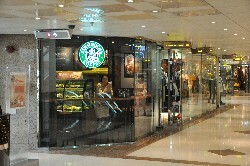 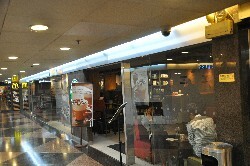 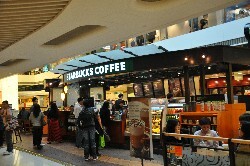 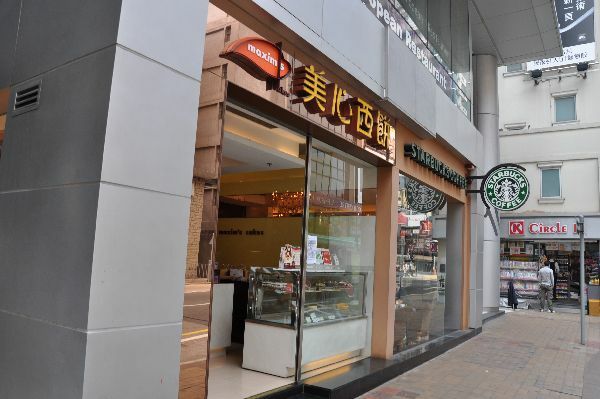 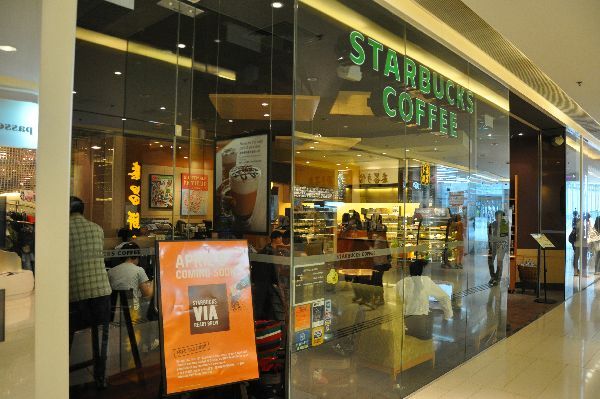 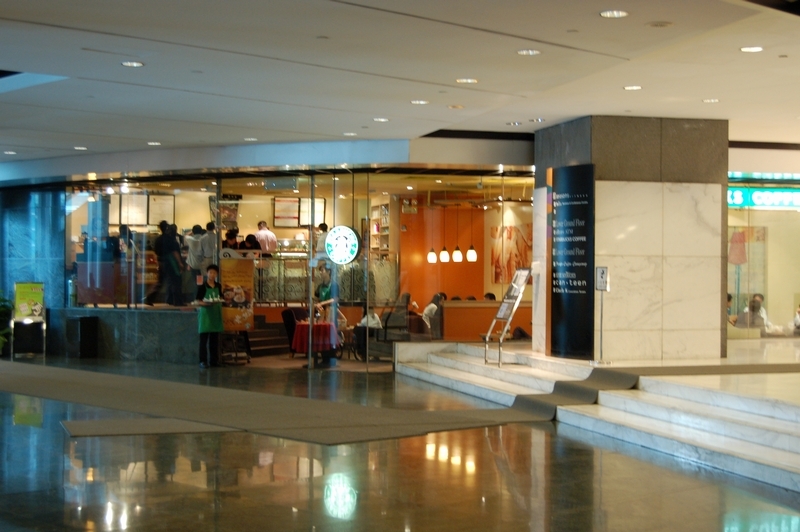 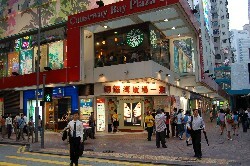 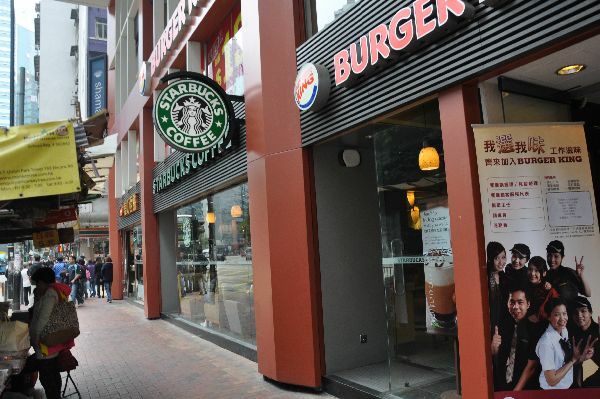 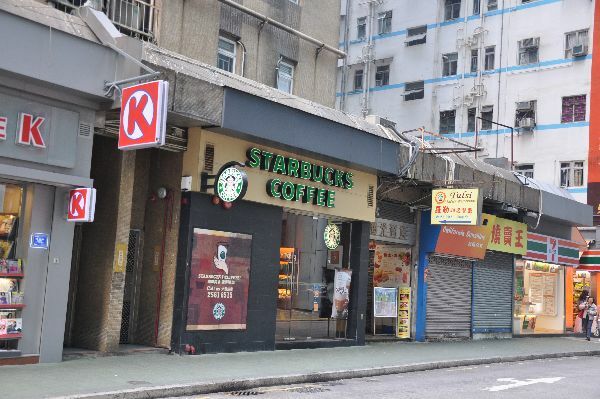 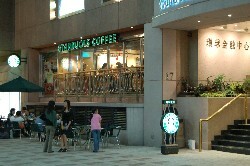 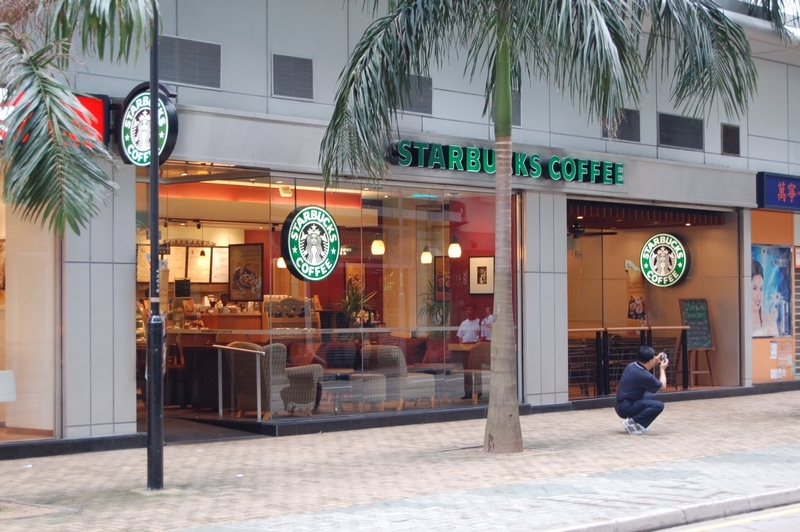 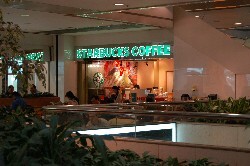 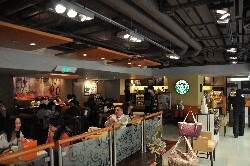 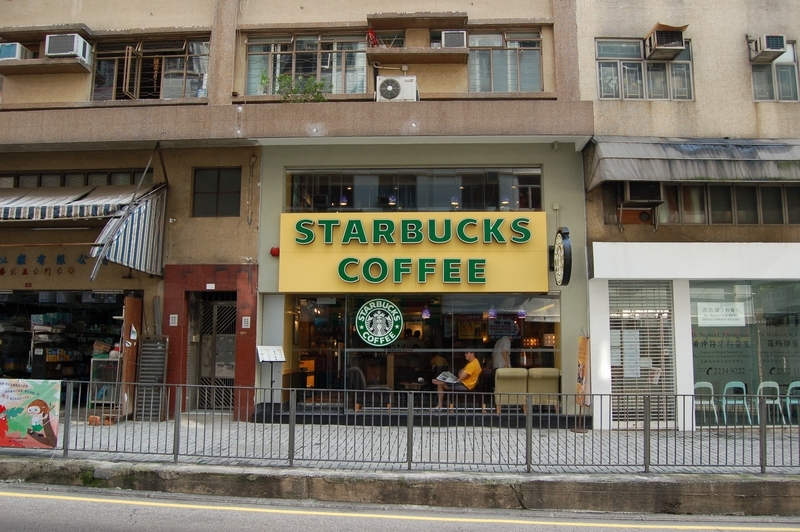 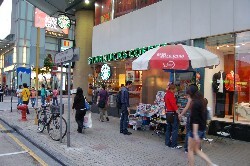 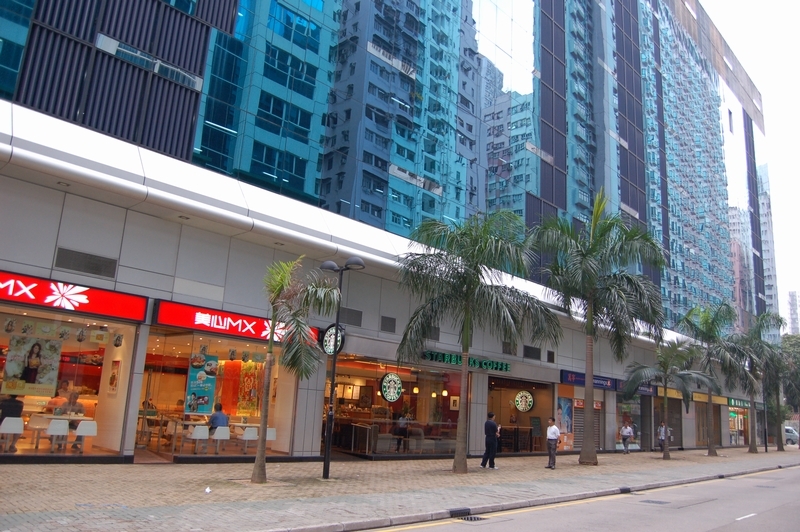 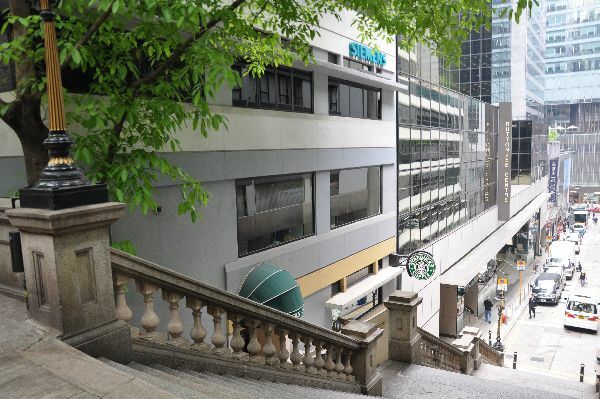 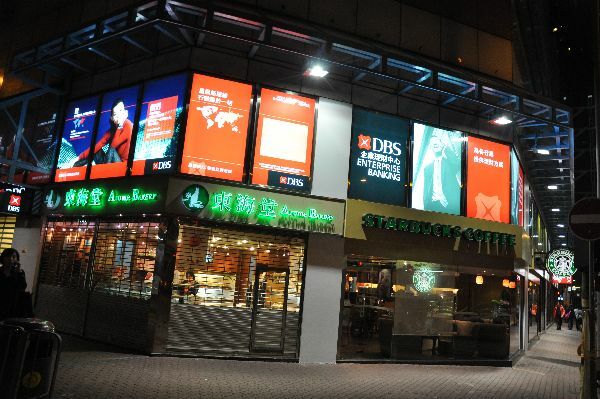 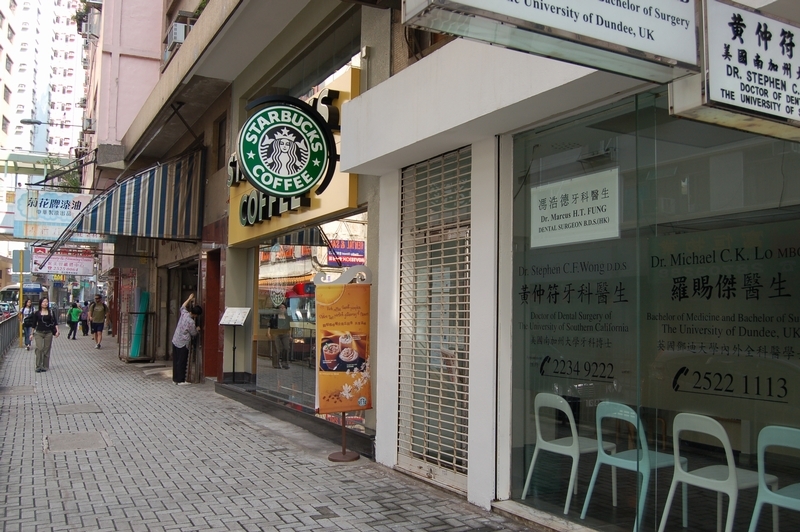 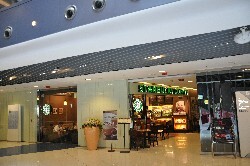 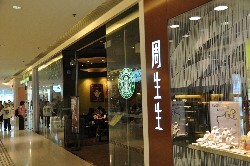 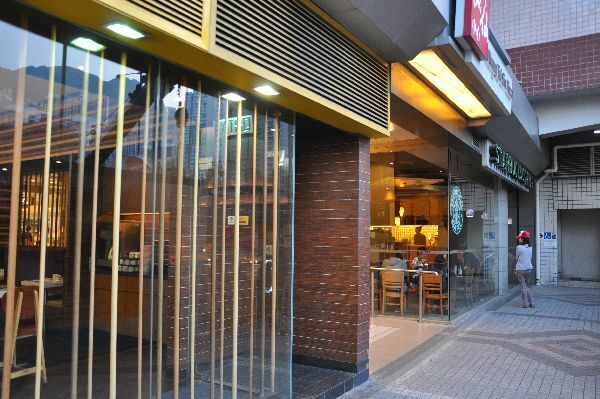 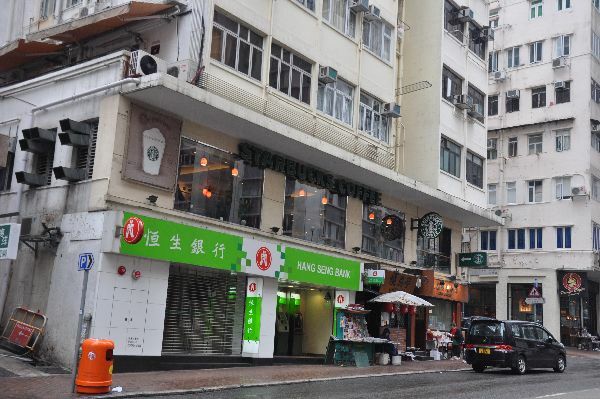 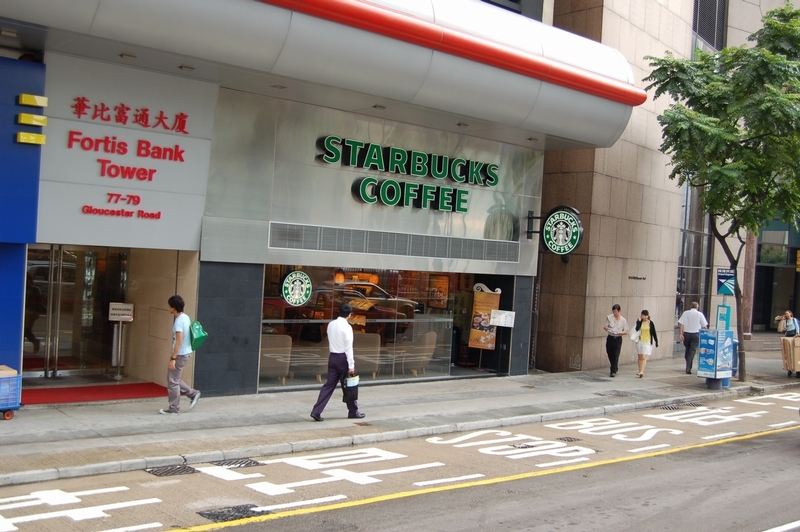 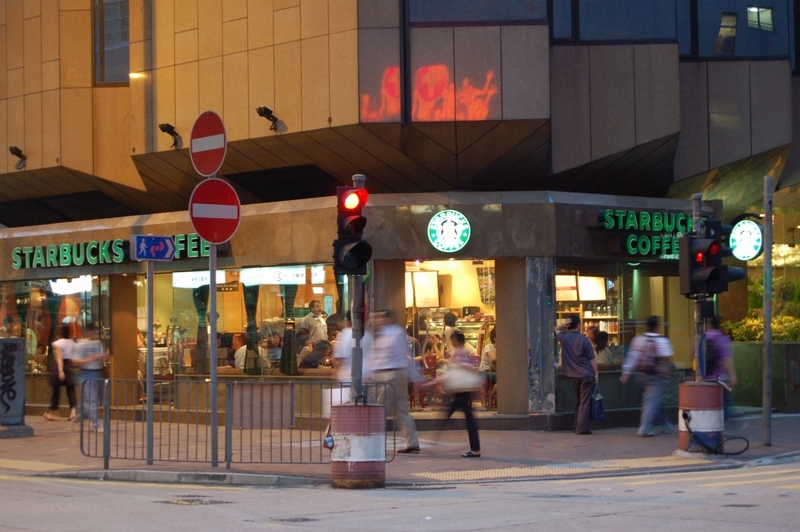 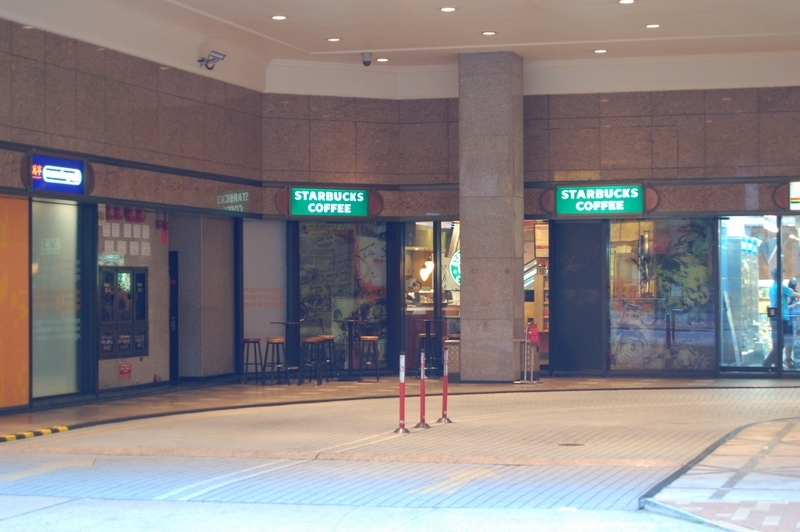 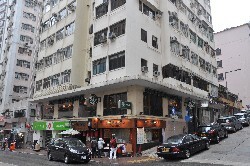 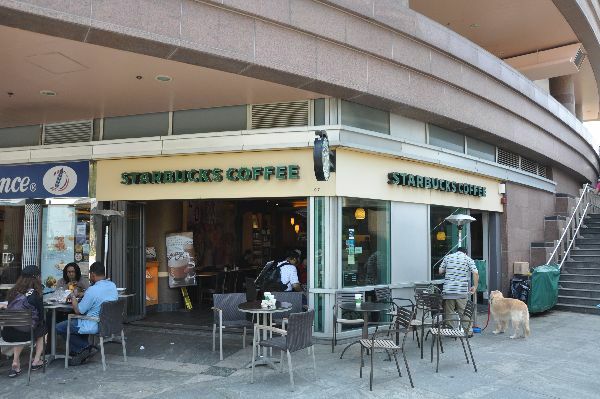 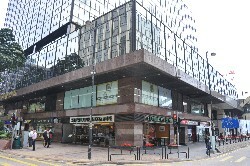 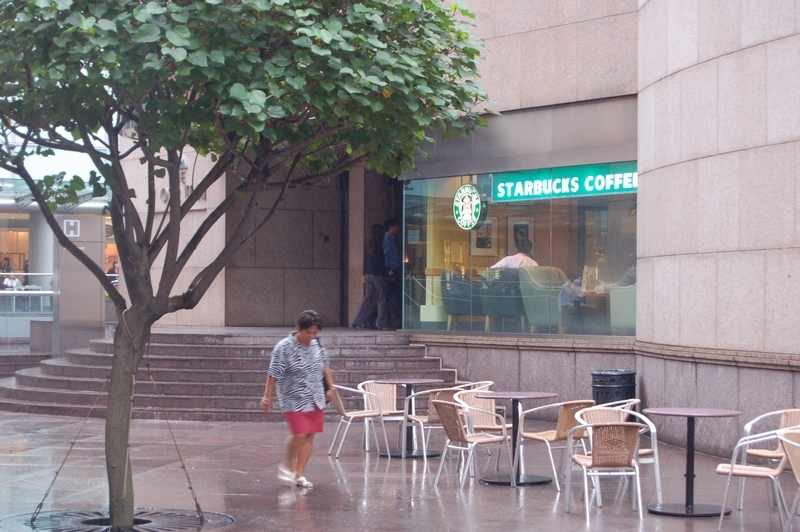 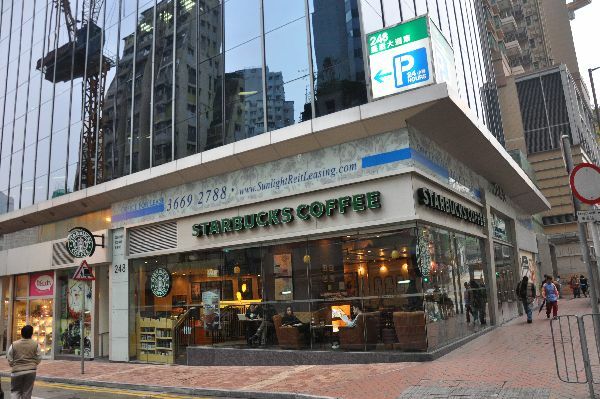 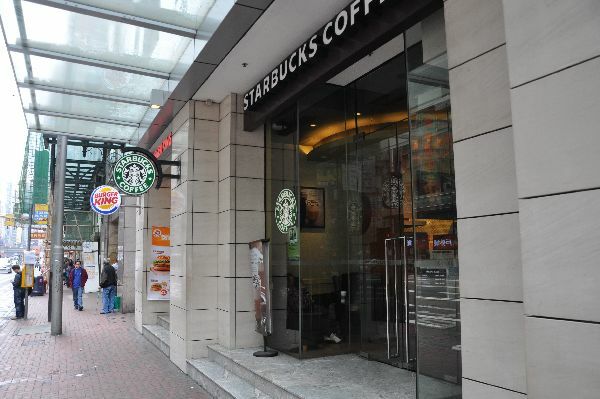 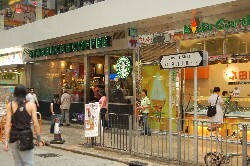 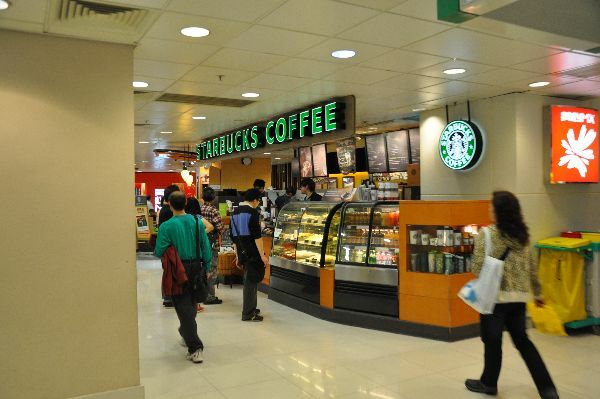 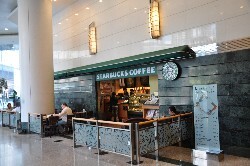 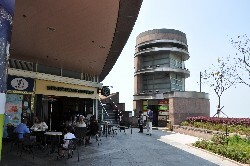 Actually on Avenue of Stars, Hong Kong's equivalent of that famous Hollywood landmark, this store offers perhaps the best view of any Starbucks in the city. 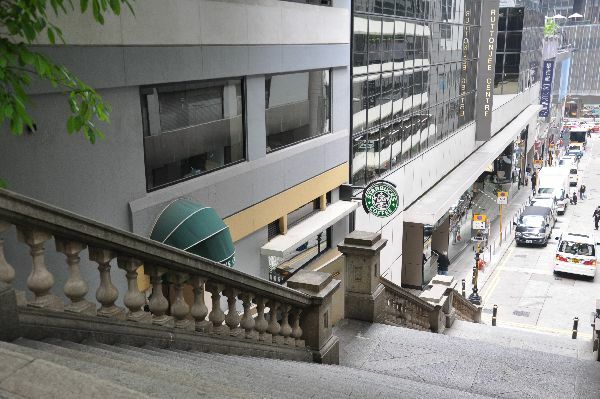 Be sure to go upstairs to the open-air balcone--it is not obvious that you can, because there is no staircase--only a lift. 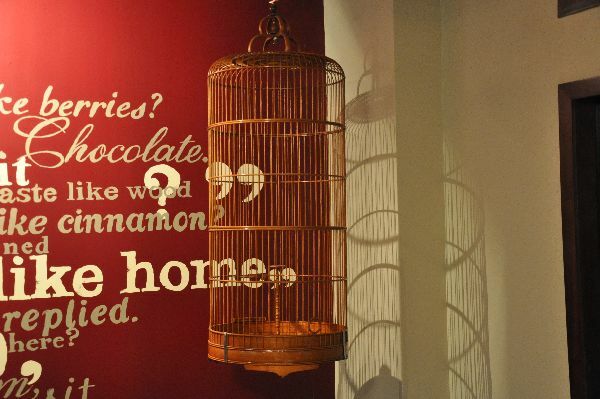 Oh, sweet! 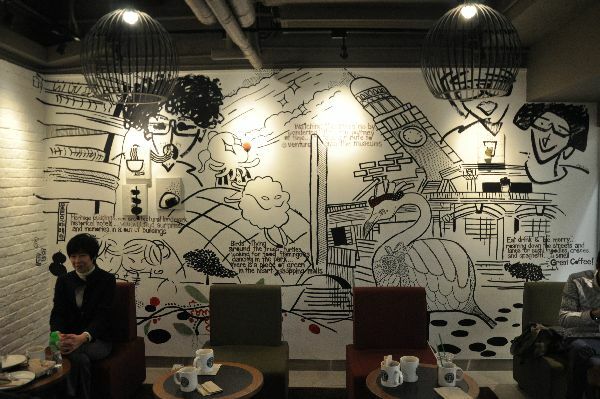 This relocated store sports a new design concept and a very unusual feature, a cool and quirky mural on a back wall! 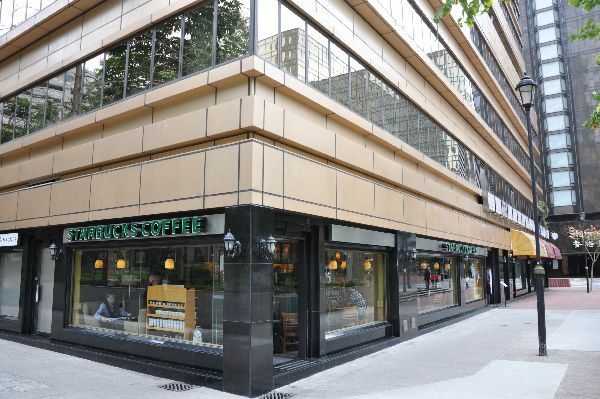 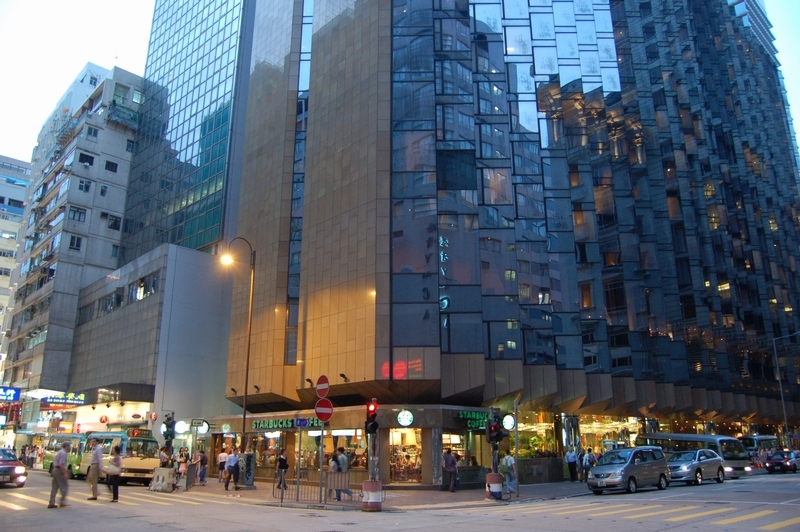 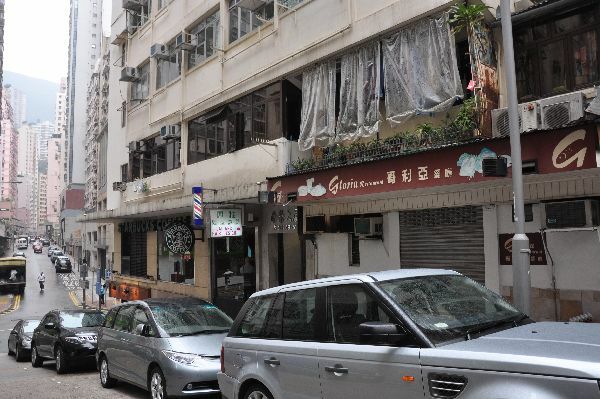 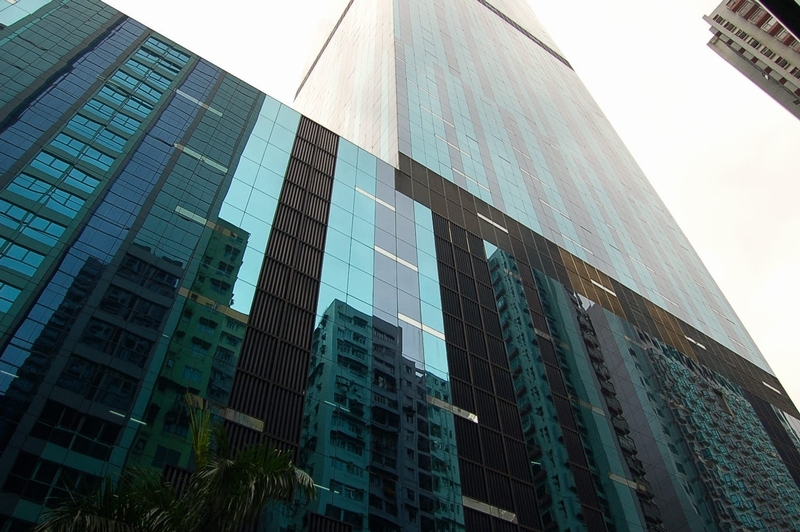 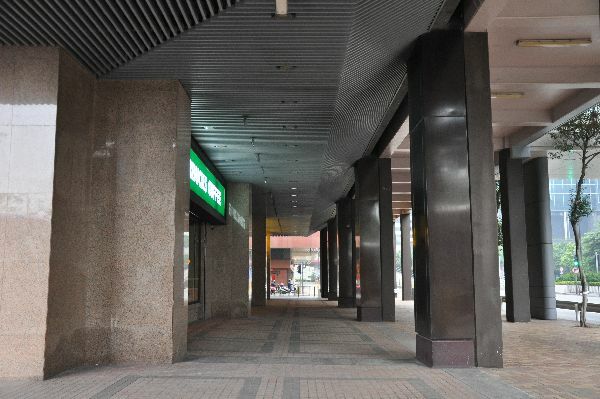 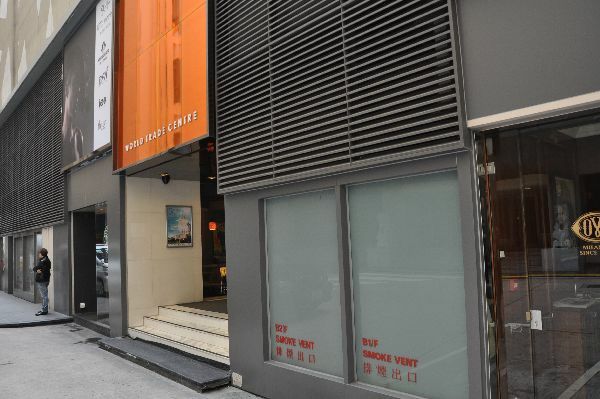 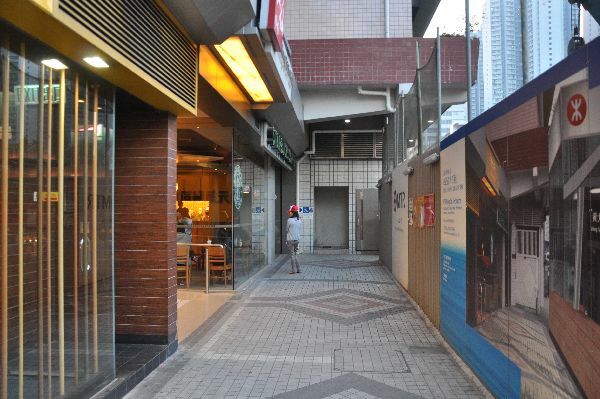 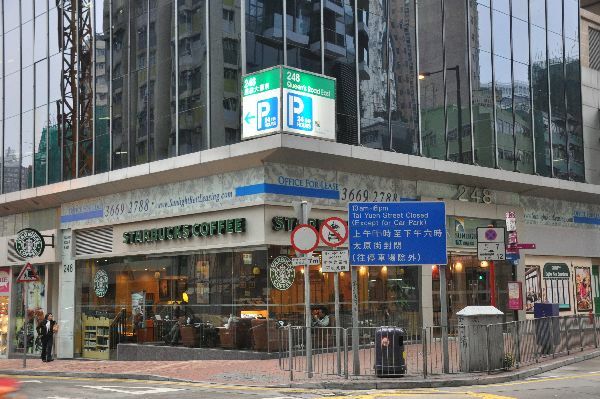 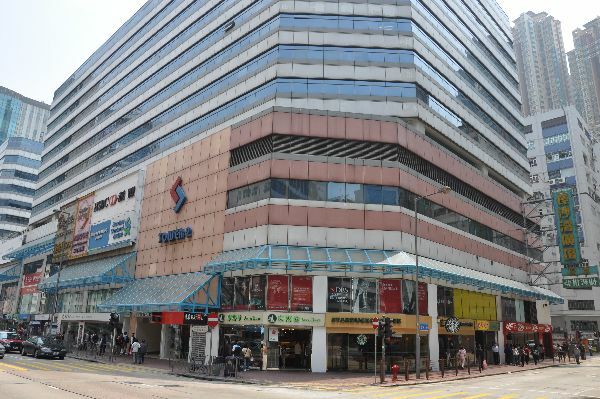 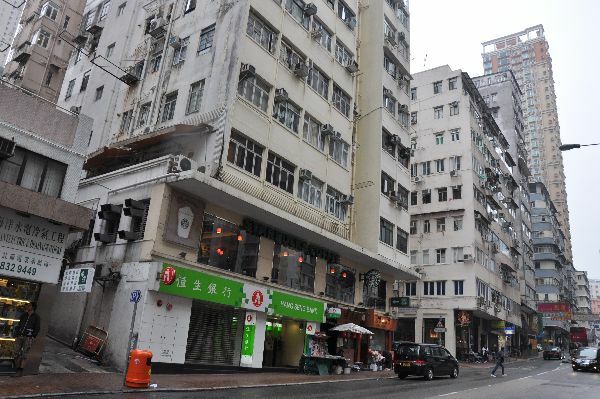 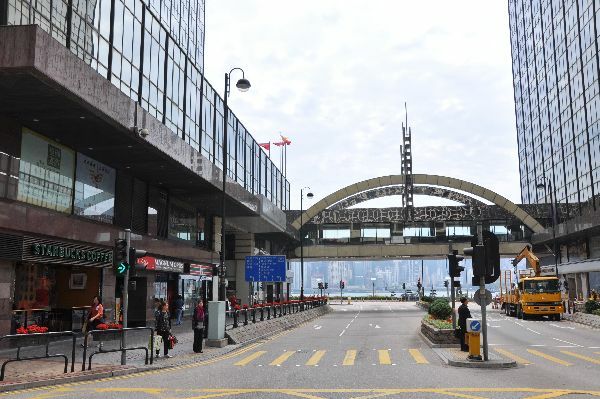 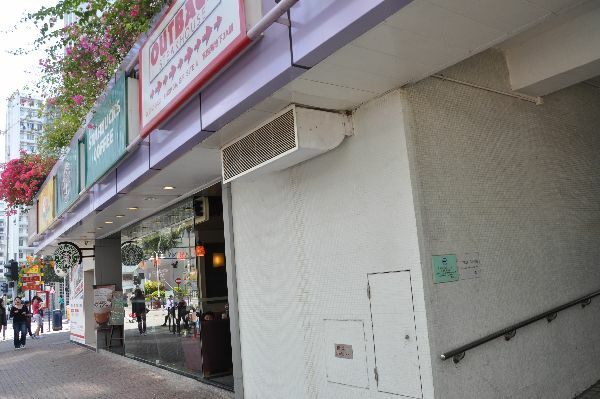 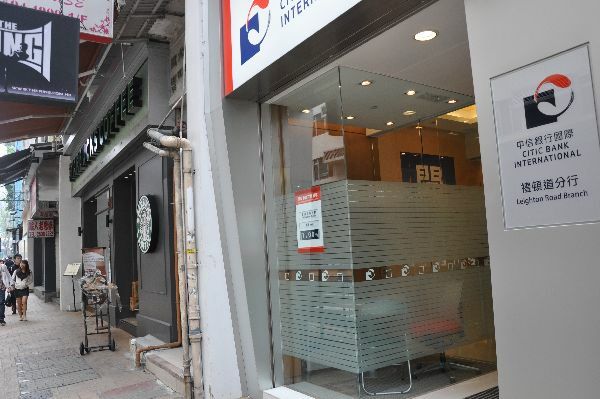 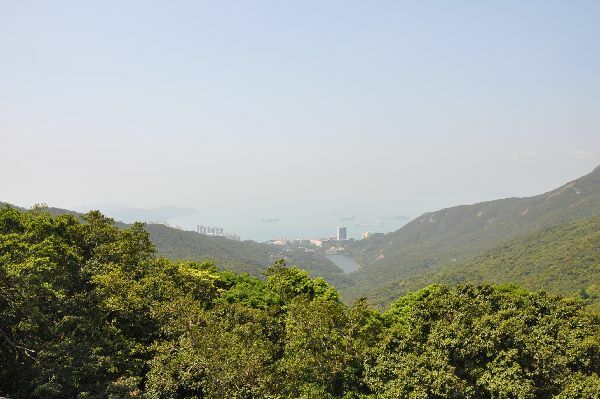 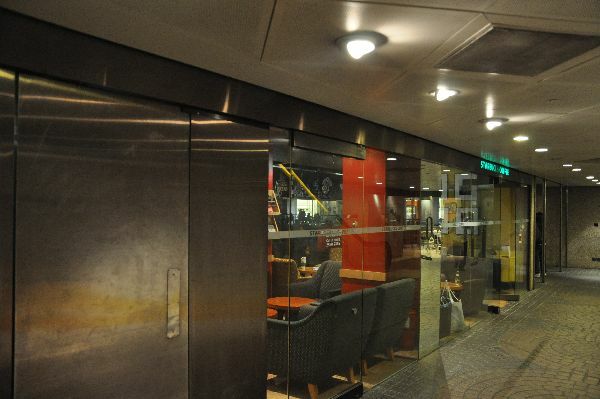 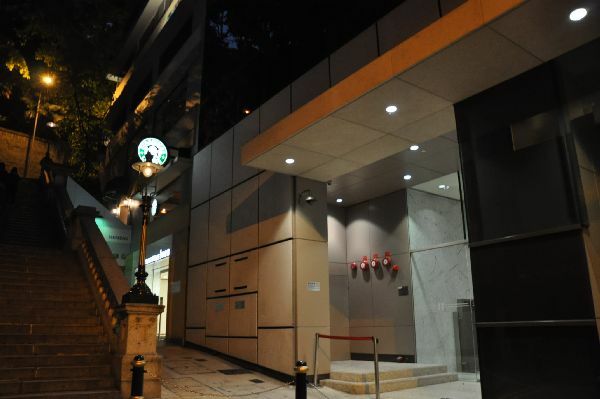 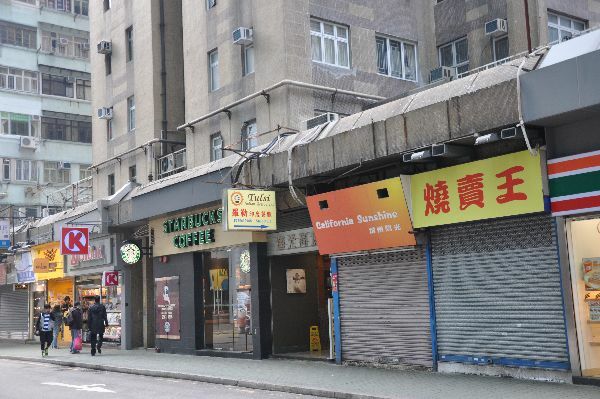 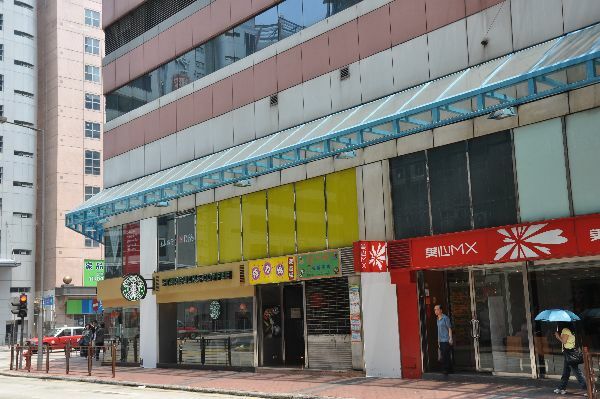 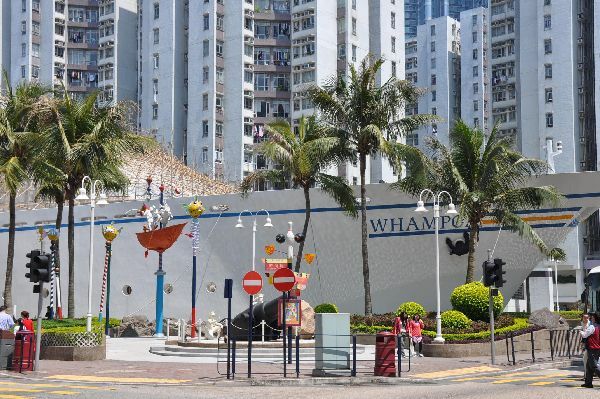 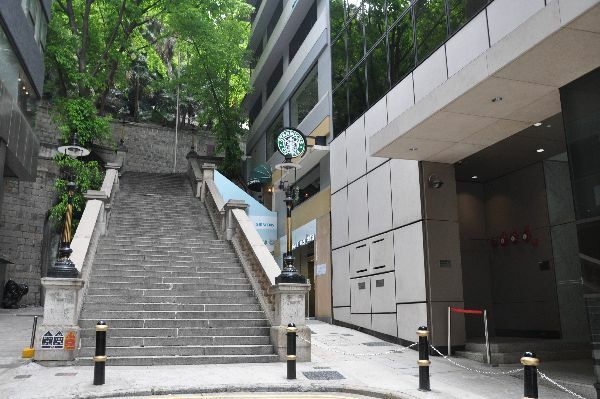 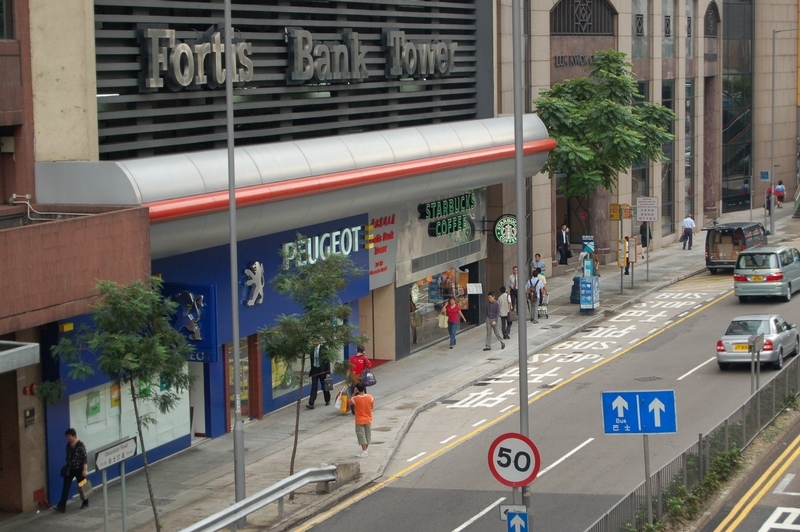 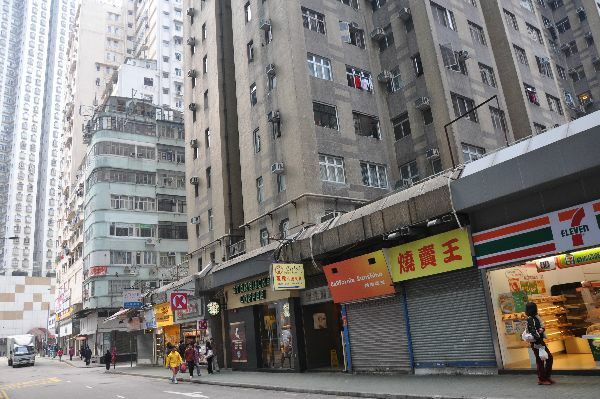 Yes, there's another location in the Wanchai Tower across the road, but seeing as how Gloucester Road is the primary thoroughfare through the district and hellah busy, it's a good thing. 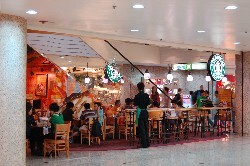 This store, larger than I expected for a "mall", has a couple of standard tall tables, but unusual stools.